I am so incredibly excited to introduce this next set to you. It is something that you are going to be thrilled to use in your own projects over and over again! Possibly even a product that you won't be able to live without! Embellishments is a new stamp set designed by Tiffany Pastor. This set is full of a variety of bold flourishes and other embellishments that can be used alone or as a companion to other images in your collection. Especially bold sentiments! Tiffany has been able to capture the essence of vintage style in a clean, modern way that you will find applicable to a variety of types of projects. Embellishments will be available for sale on August 15th. Embellishments contains a total of 24 stamps (1 border, 2 large flourishes, 7 smaller flourishes, 1 fleur-de-lise, 3 small accent images and 11 sentiments). In addition to this fabulous stamp set, a coordinating die is being introduced that will cut out the two largest flourishes from this new set with ease! The Embellishments die will be available for sale on August 15th. This is a single die that includes coordinating shapes for two of the largest images in the new Embellishments stamp set. Now that I have made the official introductions to these fabulous products, let me show you a few of the creations I've created with them. The first project I have to share with you is a scrapbook layout I created which allowed me to use the flourishes in this set in a few different ways, all on the same project! To begin, I first took one of the large flourishes and stamped it repeatedly on Melon Berry Cardstock using Vintage Cream Ink. I am just totally in LOVE with this image and the beautiful pattern that can be created with it! 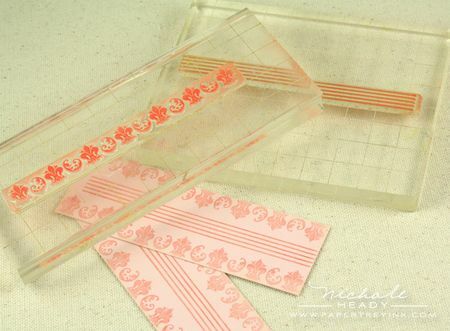 To create my second pattern, I stamped the border image from Embellishments on either side of strips of Sweet Blush cardstock using Melon Berry ink. I then followed those up with the striped image from Background Basics: Retro through the center. After edging all of the patterned pieces with Vintage Cream ink, I adhered them together to form the decorative strip at the bottom of my layout. I just love what a soft and romantic look I was able to achieve. Now, for one of my favorite parts! The die & image coordination! Here, I first cut Vintage Cream cardstock with the die to create the two shapes that coordinate with the two largest flourishes in the set. I then stamped the images on those pieces using Melon Berry ink. The detail and the precision with which these two products work together is just simply divine! Here's a close-up of one of the finished flourishes paired with the felt flower details I made to adorn it. Can't you just picture this beauty in a variety of different colors?!?!? Here, I assembled the title for this layout from four individual word stamps from the Embellishments set on a single block. The font combination that Tiffany chose is so wonderful to work with. I absolutely adore them and the way they work together! The title was stamped with True Black ink. To add emphasis to my photo and help tie it into the rest of the project, I used a Copic Marker to tint a portion of my black & white photo. With just a few strokes of the pink marker I was able to add definition to Hannah's pink ballerina attire. Notice too the date I was able to add to the corner of the photo using Mini Scrapbook Series: Library Ledger and Black Noir ink. I always love adding small details like this. The journaling block was created with the new Mat Stack 4 die (more about this later in the week), cut from Vintage cream cardstock. I added journaling lines to it using one of the images from Mini Scrapbook Series: Library Ledger and Melon Berry ink. I also added one of Tiffany's sentiments to the top portion of the black with True Black ink. After seeing how cute this turned out, I could easily make it in 20 other colors to use on other layouts and cards! 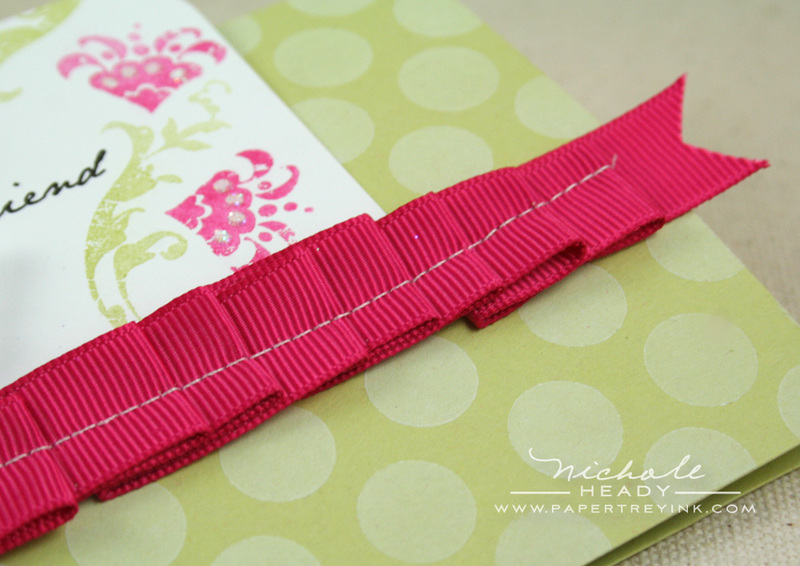 A strip of Sweet Blush Grosgrain ribbon was added to the center portion of the page to serve as a neutral border. The final assembled page is just spectacular. I love the combination of all of Tiffany's different images and think they were a perfect compliment to this photo. This bright and cheerful color scheme would be sure to brighten anyone's day! 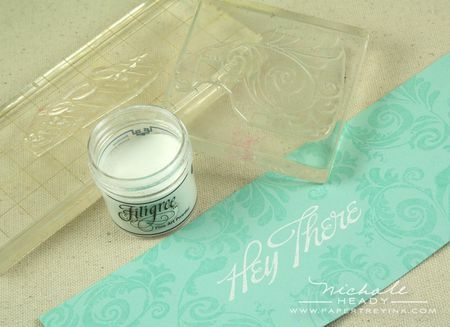 I started by stamping the "Hey You" sentiment from Big & Bold Wishes with Versamark ink onto Aqua Mist cardstock. I then added White Filigree embossing powder and heat to set. After the sentiment was completed, I went back in and added the surrounding pattern with one of the large flourishes from Embellishments using Versamark ink. 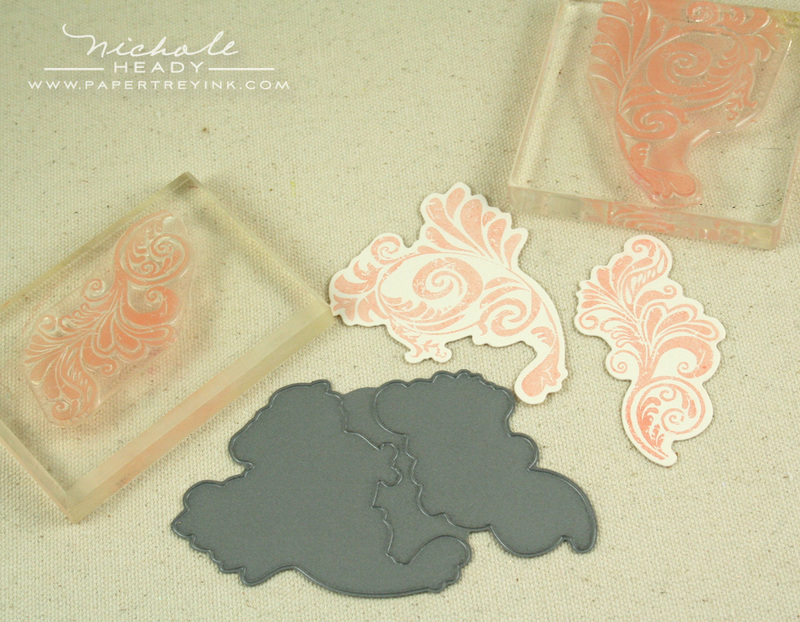 You want to do these steps in this order so you don't end up heat embossing the pattern as well when you are applying the powder. There is a small floral image included in this new set that coordinates well with our Large Scallop Border die. Tucking one of these images into each of the scallops is a wonderful way to dress them up. 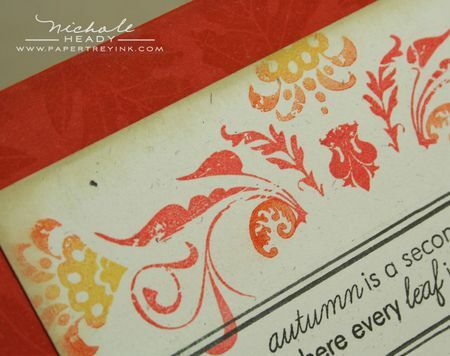 The border was die cut from Harvest Gold cardstock and then stamped with Summer Sunrise ink. 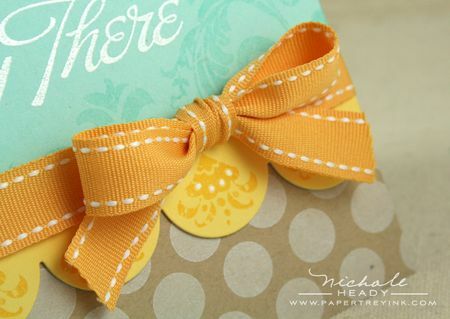 Once the border was added to the card, I topped it with a big fluffy bow created with Summer Sunrise Stitched ribbon. I also ended up adding white dots to the stamped florals using a white gel pen. The bottom portion of the Kraft card was covered with polka dots created with Polka Doe Basics II and Fresh Snow ink. I love the fun combination of patterns on this card and how whimsical the final product turned out. This card uses the same floral image I used in the previous project, just as a focal point instead. Here, I have stamped a small flourish with Spring Moss ink to represent the stem. Meanwhile, the floral images were added to that stem using Raspberry Fizz ink. I love how I can use this image as part of a border or a focal point and the looks are so amazingly different and versatile. The sentiment, another one from Embellishments, was added using True Black ink. I also used a 2-way glue pen to add a few dots of glitter inside the open portion of the floral images. Raspberry Fizz Grosgrain ribbon is pleated across the front of the card using my sewing machine. I love how this border helps the Raspberry Fizz flowers in the focal point pop. I created the butterflies with two different types of tools. The large one is created with our Butterfly die. The smaller butterflies were created with a Martha Stewart punch. After punching those from Stamper's Select White cardstock, I stamped them with the smallest dots from Polka Dot Basics with Raspberry Fizz ink. They were then run through my Xyron sticker maker and covered with a layer of prisma glitter. I positioned the butterflies at various angles, slightly folded in the middle so as to appear that they are in flight. I love the design of this and what an artistic flair it took on. This next project is very different from the others. It is a simple layout in design, but has a wonderfully rich pattern embellishing its' cover. It all started with these three images assembled together on a block. After making this grouping, I was able to stamp them twice, rotating the black 180-degrees before the second impression using Terracotta Tile ink. I love how ornate the frame turned out. After stamping the frame, I added the small floral accents inked in both Summer Sunrise & Orange Zest inks for a variegated effect. The sentiment (from Heather Nichols' new set, Falling Leaves, more about this throughout the week) was stamped in True Black within the center of this flourished frame. I also followed that up with borders drawn with my black pens and a ruler to help define the sentiment. I swiped a little Tea Dye Duo around the edge of the block to help give it a more vintage feel. I also stamped leaves on the Terracotta Tile card base using Terracotta ink. I don't think there is any debating that this project embodies autumn and all of the rich, beautiful colors it holds. This is a simple, one-layer thank you card that could easily be produced in different color schemes. I started by combining a large & small flourish in the two corners of the card cover using Hawaiian Shores ink. I was then able to add the "thank you" sentiment from the Say It With Style stamp set, using Simple Chartreuse ink. One of my favorite color combinations. A simple little clear rhinestone was added between "thank" and "you" as a finishing detail. I also added an embossed border using my Scor-pal and Scor-pal tool. The finished project is classy, sophisticated and just a touch modern. This last project proves that Embellishments doesn't have to be JUST for feminine projects, it works jut as well for masculine projects. I stamped the two largest flourishes in Enchanted Evening ink on their coordinating die-cut shapes, made from Stamper's Select White Cardstock. 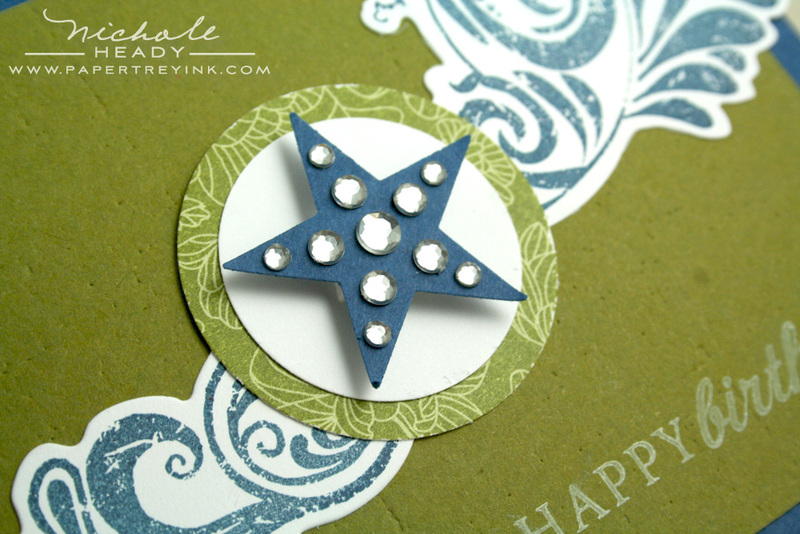 A set of punched circles paired with a punched star create the central focal point. I also embellished the star with clear rhinestones to help add emphasis to it. You'll notice here that the Ripe Avocado background of this card was used with the Canvas side of the Linen & Canvas Impression Plate. The sentiment was added with Fresh Snow ink from the Enjoy the Ride stamp set. I just love how this turned out and I think it would be appropriate for nearly any boy in your life! This prize package has well over a $50 value, so you definitely won't want to miss your chance to enter! You have until 7am EST, Wednesday, August 11th to enter this contest with your comment. Only one comment per person please. One randomly selected winner will be announced by noon EST the same day on our August Release Winners page. Thank you for stopping by today and good luck! 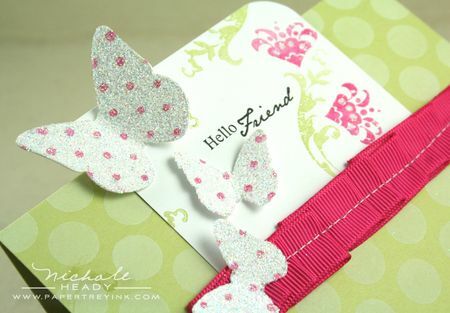 Be sure and stop by Betsy Veldman's blog today to see what she has created with Embellishments. Beth Silaika is focusing on her new set, Been Boo'd. Erin Lincoln has an extra special post prepared for you using Been Boo'd as well. (I will be featuring additional project using this set tomorrow). Heather Nichols has created some amazing work using the two new sets she is introducing this month. Beautiful set. Love the coordinating dies. I think this set will make wonderful and elegant wedding cards. I think this set will add that extra touch to all sorts of projects. I simply love your scrap page – gorgeous. This set is a must have for me, I can’t wait to get my hands on it. Congrats to Tiffany. This set is just so versatile and pretty and the coordinating dies really make it multi useful. Love it. I absolutely love the sets that can be used along with almost any sentiment and this is one of those! I adore the vintage and classic feel of this too!!! Oh my this is like wallpaper. Imagine what you can do with these stamps. Like when somebody is moving… Love it. My firs impressin is: I have to have this set. Love love love all the flourishes and the sentiment font combinations. Gorgeous. This set it great. I love using flourishes for backgrounds. Again, I love the die. Using dies makes it look like you purchased coordinating embellishments, only you can make as many as you want, in any color you want. Another must have. Another great stamp set with die! I sure do look forward to this time every month! Love it when there are dies to match! Such a classy set! First, welcome to Tiffany! Second, I love the stamp set! 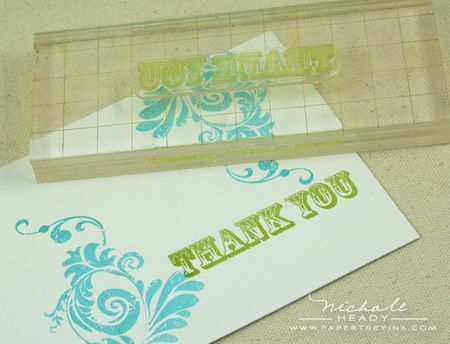 Thanks Nichole, as always, for showing us how we can make a variety of projects with one stamp set. 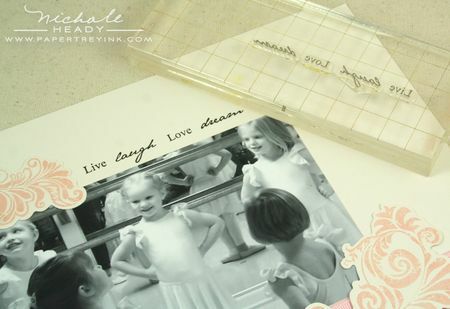 The ballerina scrapbook page is my absolute fav! This stamp set will get lots of use! What a LOVELY set…can’t wait to get my hands on it!! LOVE the shape of that new Mat Stack die, too! Gorgeous projects, everyone! You are SO right, this is definitely going on my wishlist straight away. This is a wonderful set and a must have. Its versatility is fantastic. The samples are beautiful! Can hardly wait to make my own backgrounds with these new sets. I love this set…beautiful and versatile! I’m excited that there are dies to match!! Embellishments looks like a fabulous set! I love anything with flourishes! And I’m thrilled there are dies for two of the flourishes! Thanks for the chance to win this great package! 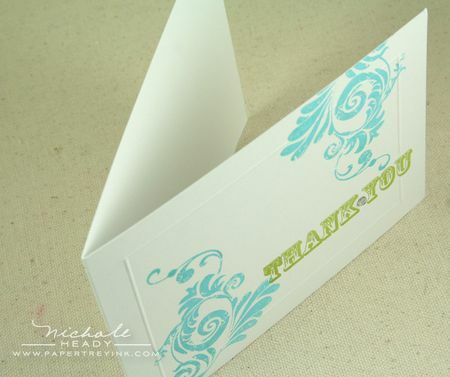 I’m lovin’ the simple white card with the flourishes and sentiment! Matching dies look great. This will be a set that is reached for time and time again! The die is a bonus! Looks like another great “must have” set from PTI. Thanks for the great ideas on using it. Well Nichole, you’ve done it again! This set looks amazing and I’m blown away by all the projects you’ve showcased today! I really hope I win this package as my Fancy Flourishes set is a bit worse for wear too! Fancy Flourishes is one my favorite stamp sets, so I was not keen on another flourish set. This set, however, is very different, and the sentiments alone may sway my decision making. Those flourishes are so beautiful and being able to cut them out brings a whole new way to use them in our projects. Another great from the wonderful PTI team! I love how different all your cards are, stunning! What a beautiful set! I love that there are dies to coordinate! Oh wow! I don’t think I have ever wanted a set more than these! They will work beautifully with EVERYTHING. I sure hope you have plenty on hand because this is definate a must have. Oh MY!! I loved this set the minute I realized you made the pattern at the bottom of the scrapbook page. Beautiful! And so perfect. This set will do wonders for my European scrapbooks!! I do not have Fancy Flourishes yet. It’s on my wish list scheduled to be picked up with the next order, but I cannot imagine the beauty to be created with the two together. So exciting! This set is amazing and versatile. You really can create any type of style you choose with this set, just by changing colors and the way the pieces are laid out. wow! love this set! This is so classy and will be on my wish list this month. I love the first project so elegant!! Wow…. a plethora of ideas- all beautiful! Love the flourishes and the dies! A must have for sure ……. I wish you had co-ordinating dies for all of your stamps! Just BRILLIANT with the flourishes! Especially LOVE the scrapbook page. OMG this new stamp set and coordinating die is just amazing. this style is sooo me – I am just loving vintage at the moment and this set is so versatile – you even gave a more masculine take on a card. I just love it!! Absolutely beautiful set! I can’t wait to see the whole set, I am loving it already. Your cards are beautiful, and your page is truly awesome! LOVE these flourishes and dies to match–wow! And all those great sentiments, another must-have set! A new flourish and matching die – pinch me please I have gone to crafting heaven! I love the vinatge look to your beautiful scrap page – modern but classy! Flourish are my best friends 🙂 and I think the coordinating dies are a must have! This is only day 1…… Can’t wait! So excited about Fancy Flourishes! And this is only day 1!!!! WOWSA!!! I am always amazed at all the creativity here!!! Nicole, you and your DT are amazing!! You take these beautiful stamp sets and make WONDERFUL projects!!! I’m loving how especially versatile this set is!! I think that the way the flourishes produce backgrounds is great. When I saw the star card with the flourish coming out from behind, it looked like a shooting star. This got me thinking, how about having one of the flourishes coming out from the back of the plane image as fumes of sort. Wow! This stamp set looks so versatile! Beautiful set! I love the backgrounds and patterns made using this…A must have! i really love the dies to coordinate… a very nice set! I could never have too many flourish sets, so this one will no doubt be another set added to my collection. Oh my! It’s the first day of the countdown, and I am already in trouble! I love the new Embellishments set, matching die, and the new mat stack die! They are all must-haves! Great set…. I’ve been in love with flourishes for long… I can’t wait to put my hands on this set and also the diessss are a wonderful addition. This is wonderful! Some fresh new flourishes! I love making backgrounds with them. Holy smokes you’ve been working hard. Love all the projects. I think it looks like one of the “go to” sets! Simply gorgeous images, and so fab to have a die cut for the flourishes, this is a fresh approach and will work a treat in my creative space!! girlfriend you are one heck of a creative talented lady! that LO especially – genius creativity! i ADORE this new set! your killin’ me! i met you at CHA and told you i have this little part of me that secretly hopes each month i your stuff WON’T be so fabulous…hee heee – looks like your going to do it again! I love flourishes but would never cut one out, so I LOVE the die that goes with this set – the stamps are great too. I love this new set, and especially the dies. Your cards are inspiring and I’m getting excited just thinking about all the posibilities! its so fun with this set! Love it! What an elegant set, and so versatile! Your samples are gorgeous as always, but that scrapbook page is just spectacular! Great addition to the line up, this will show off many of the sentiment stamp sets beautifully! I’m almost speechless! What a gorgeous projects shown here. And I look forward to the whole stampset. What a great “go to” set to take a card from ordinary to WOW! The design team has really offered up some great ideas. Wow! Love the baskgrounds that were created. Flourishes are so easy to use for any project. All of these cards are so great, but I think I love the fall one the best!! I can see so many uses for this set. I love the way you used it with the border stamp. And the dies are wonderful. Wow! Wow! Wow! Fancy Flourishes is one of my favorite sets and I think this is a must have!!! This set is so elegant! I love all the projects!! Wow, this set is gorgeous! I love each and every one of your samples!! What a gorgeous set! My first impression is that it will make amazing diy designer paper! Perhaps I got the idea from your first project, Wow! And as always the samples are amazing! Wow! Gorgeous scrapbook page! I love this set — I can see myself using it over and over again! This set is so versatile. I love that there is a die to go with the main flourish. Looks like more PTI fun this month. Welcome Tiffany! PTI again doesn’t disappoint! Love this new set and that ballerina page is adorable. Definately getting the creative juices flowing. Yet another great release! Wow! Your scrapbook page is incredible! And it is all made from cardstock, ink, stamps. No fancy products at all! This is the kind of set that you can turn to for any type of project – very versitile! I can’t wait to use it! I continue to be amazed at how you show one set so many ways! So excited about this monthly unveil. It seems that I “need” the flourishes with dies. Nicole, thanks so much for sharing your talented creations! Wow … my first thought is how versatile. Its not often a set can go from vintage, to elegant to fun & hip. Very cool! love, love, love this new set! Tiffany did a great job! i can see using this set for wedding or anniversary cards. i like how well it pairs with the big and bold wishes sentiments. and the matching dies….fantastic! Oh my! This new set does have numerous possibilities!!! You have definitely shown us with all the beautiful projects you shared today. I was especially drawn to the scrapbook page –so gorgeous! Wow. I love how you’ve made this set cover all bases from masculine to pretty-pretty. V cool ! Thanks for the opportunity ! I love the big flourishes. I am also a scrapbooker and love the idea of being able to use them on pages as well as cards. I would love to see more scrapbooking ideas in the future!!! Oh Nichole, I just love preview week! It is the first thing I look at on my Google Reader! You did not disappoint this morning. Your scrapbook page created with the new stamp set is absolutely brilliant!! Love the new embellishment stamps! I agree that this will be a must have set!! Anxiously awaiting for more sneak peeks. Lots of great ways to use this set. It will be fabulous. Wow, what a pretty set! I am sure its gonna be a must have for many stampers out there….love it so far! Can’t wait to see the rest! 1st set on my shopping list!! Oh my word!! I am seriously sitting here with my mouth hanging wide open!! I cannot believe how you were able to make all those gorgeous, completely different cards, using ONE set! What an amazing, versatile set. I am in awe. The first thing I would make? Recreations of each of those beautiful cards in as many different colour combos as possible! You outdid yourself. Stunning, beautiful, fresh cards. So excited about this set!! Thanks for all the inspiration – what a great way to start my day! Love this set…I am more of a scrapbooker and love it when I see “pages” using your stamp sets…..very nice…..
Beautiful projects! I like the variety of ideas you showed using the flourish images. I just adore ANY back ground building set and this is going to be the next in my stamping arsenal! Nichole, I love all the ways you’ve showcased this new set! A must-have addition, no doubt, for everyone! Love the tenth of the month!!! I can see the flourish as the condensation flame spewing from a rocket or plane at take-off on a little boy card! Now that’s versatility. Well, another wonderful stamp set with a variety of uses. I love how all Papertrey’s stamp set are so interchangeable with other stamp sets. Wow, so many possiblities! Can’t wait to see more. Thank you for all the inspiration! As you said, I agree this set has endless possibilities! All of your examples are gorgeous! The scrap book page you did was devine! I think this set would also make beautiful stationary and note pads! Thanks for the chance to win! 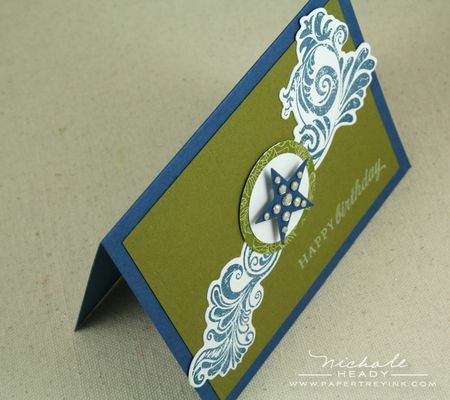 I love this flourish set and the die cuts to go with it…. thanks for the chance to win this beautiful set…..
Just lovely…who doesn’t need another flourish stamp set!!!! Really really love the coordinating dies! Wow!! You did so many different things with this set, the scrapbook page is adorable! When I saw the sneek peak I really didn´t think I needed another set of flourishes. Boy was I wrong!!!! I love it and can´t wait to use it. Another very nice set for adding a bit of fancy to a card. Can’t wait to see all of the sentiments. Oh my this is fantastic! I am so excited about this set because hello! Who doesn’t love flourishes? Beautiful set with many possibilities! Especially love the flourish frame! Wow! These cards are great! and I really like the journaling on he scrap page. Looking good!!! I love the more elaborated flourishes, great addition to the Fancy Flourishes set. Okay, you’ve done it again–introduced a stamp set that I have to have. My husband teases that we are going to have to add a wing to our home to house my PTI treasures. I love how you showcased this wonderful set by showing the many different uses it has. My favorite sets are those that can be used in a variety of ways. When I first saw the sneak peek, I didn’t think that I needed this set. Seeing all of the projects today has changed my mind. They are fabulous! Thanks for all of the inspiration! 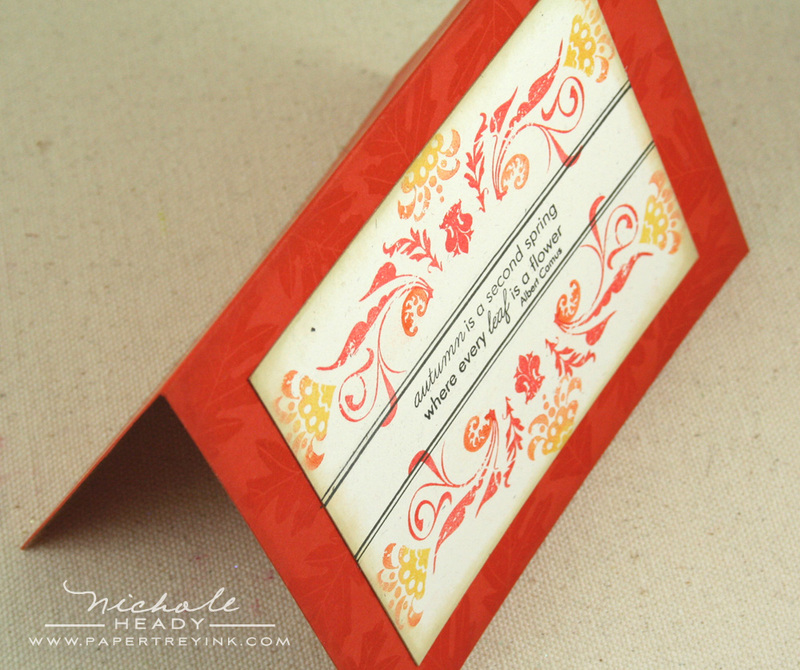 Love the flourishes…and the dies! Another great set I’m gonna need! Another great stamp set and awesome ideas. You are such an inspiration. Can’t wait to see what is in store for the rest of the week! How did you read my mind? I’ve been obsessed in trying to find flourishes that are similar to the ones that Vs used for the Tour de France broadcasts. These are very close! Amazing!!!!! Very versatile design Tiffany! A nice array of projects Nicole, beautiful! My favorite is the matching die, making your own embellies, in any color you want, with or without glitter, embossing or not, masculine or feminine…. Turns out I couldn’t make it to CHA so have been making a wish list for my birthday, Aug.14, waiting to see the August release to complete my order. Embellishments and their dies are definitely on the wish list!!! The set and dies are a great combination! I love it. The Layout is gorgeous! So Sweet! great job! This set is so pretty. Loved all of the different things you can do with it. I am excited to see the rest of the week. Once again, PTI amazes me. Great set & dies; gorgeous projects, Nichole! I am excited about the Embellishments set and dies! The stamps are perfect to create your own designer paper — as proven by your scrapbook layout. I have a lot of d.p., but often still can’t find the color I need for my card!! With this set, I can make my own in whatever color I choose!! Woo Hoo!!!!! Love my Fancy Flourishes stamps use them so often. But this set is great too love the matching dies. Love the jar set …so looking VERY much forward to see more. Oh that scrapbook page is stunning! Once again you showcased how versatile a set can be! All of the projects today are so fun to look at, thank you! 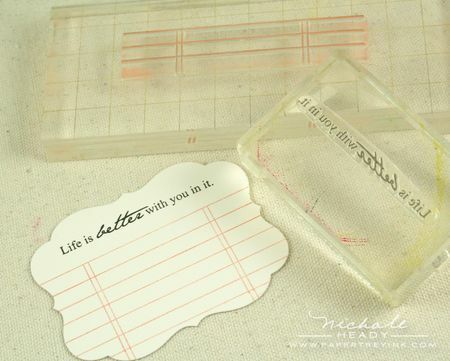 A beautiful addition to any stamper…a must have! The flourish designs are beautiful in this set and having dies to coordinate just seals the deal. Everyone is going to want this combination. Looks like another pretty, versatile set…I especially like the dies that coordinate with it. Can’t wait for the full reveal! I adore that simple thank you card. The dies will make life sooo much easier..lol. I love this set with the coordinating dies. I envision fantastic wedding cards made with it! As always, can’t wait for the new release!!! Nicole, another great release. I can’t remember the last time I bought stamps from another company, just love all that PTI has to offer! Love the versatility of this set. It works well as a background or focal point for cards or for scrapbooks. Really beautiful! I am a sucker for flourishes – this is right up my alley! I love the samples – just ADORE the scrapbook page. Fabulous set! I think my favorite project is the fall card – love the new mat stack die shape that I’ve seen as well! I love the flourishes. I have an idea already for Christmas cards. Can’t wait until I get my hands on it. Love all your projects. YOUR RIGHT!!!! this is a set one cannot live without! I LOVE all of the projects especially the masculine spin of the flourish!! Awesome projects again, as usual!!! I love flourishes! I can see me using this in so many different ways. Gorgeous!!! Wow! Can I put it in my cart right now??? What a wonderful set! Thanks as always for showing the versatility. This is definitely going to be the first thing in my cart, along with the dies!! The set and your projects are absolutely breathtaking! I can’t wait to get my hands on this set/die combo! 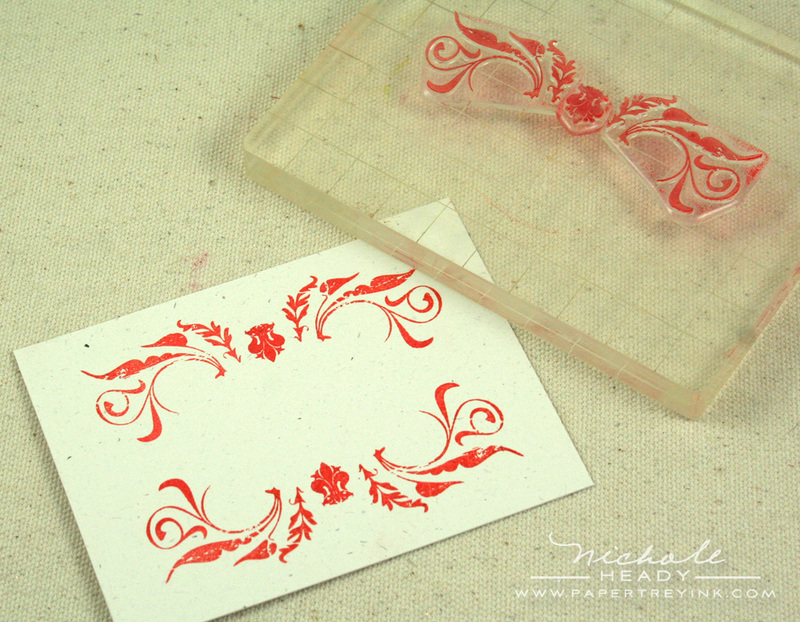 I love how you made the background using the flourish stamp. It is so elegant and I love how you can get coordinating dies with you. I can never have enough fall sets. I just adore that little turkey! This set is beautiful – and the dies make it a “must-have”! Such a versatile set! I can never get enough of flourishes! Oh, my, this is a wonderful addition to your line – so elegant! But you’ve shown how it can be used in everyday ways, too. Adding sentiments to it puts it over the top for me – I loved the first layout, and would really love to try making my own beautiful damask-like paper. Love it!!!! Once again the versatility of PTI makes such good $$ sense! You have done it again..love it! You were not kidding. Looks like this release will be spectacular. Cannot wait to see what the rest of the countdown brings!!! Love it! I think this set will add that extra touch to all sorts of projects. I love your scrapbook page it is gorgeous! I love that is matching dies. I love these sets they are absolutely beautiful. I also love the coordinating dies. This will be great for vintage pages. What a wonderful way to start the Month. How much fun! Love the set and dies! The flourishes are beautiful! I am just thrilled over the dies! Love this set and all the possibilities! Simply elegant new set and projects! I love the coordinating dies. Holy cow. This is going to be an expensive month!! 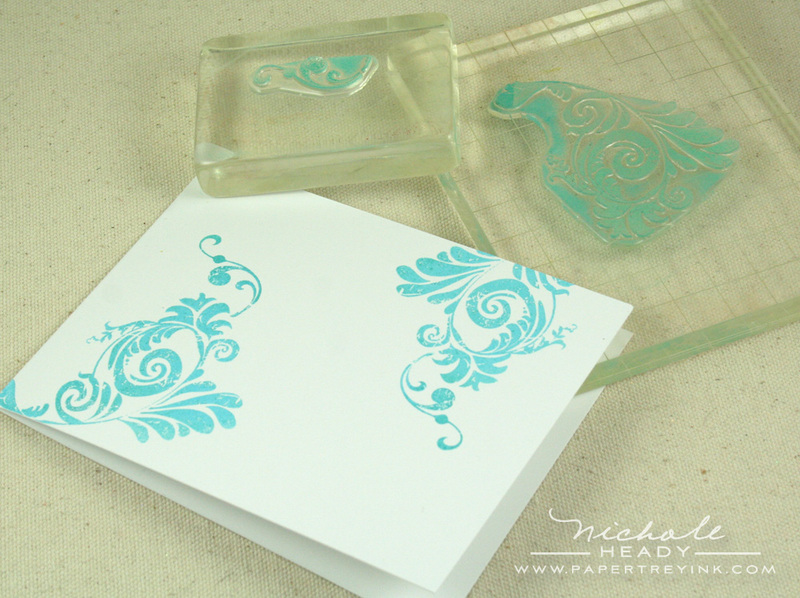 I think these stamps are great for elegant cards and i like the matching dies. The samples are fantastic. Looks like a great stamp set. What an absolutely love, versatile set, and I love how the dies match so perfectly. I love to cut things out, but it is so time consuming…brilliant! I love the new stamp set and matching die! This is going to be such a versatile set. WOW! What a great set! Fancy Flourishes has been on my wish list forever and now this set (with coordinating die no less) puts flourishes over the top. Let the wish list grow! Oh boy, this is the kind of set I have been waiting for. Thanks again for inspiring the creativeness in us all!! Gorgeous cards and scrapbook page. Love the “dp” you made yourself. So many special touches! 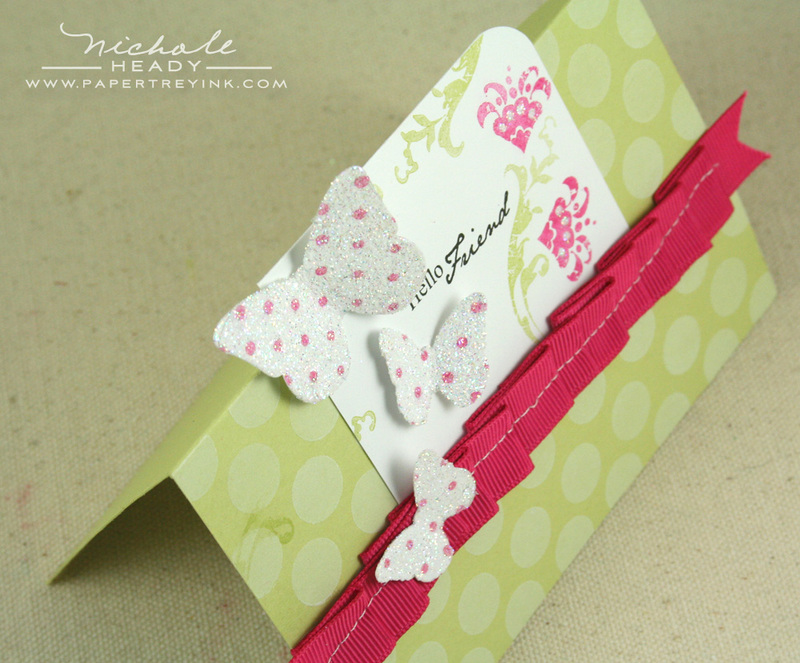 Embellishments is a beautiful set and the cards you’ve used really point that out. I love your color choices and the way this set can be fun as well as elegant. I think this is a wonderful basic set – a must for me! wow – beautiful set! and the cards you made are so inspiring. thanks for a chance to win! Such a gorgeous set, so elegant ideal for Wedding cards – and matching dies, we are spoiled. Your dies really make sets so easy and appealing! It is revolutionary to my stamping world. I love love love this set already and the die is just the icing on the cake! The sentiments are great too and I really like the different fonts. I can’t wait to see more! 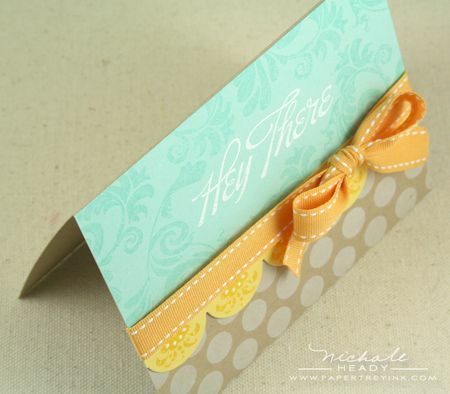 The flourishes are beautiful…love all your samples today! THE SIMPLE PLEASURES. THANKS FOR ALL THE WONDERFUL INSPIRATION! I can see it is going to be another “must have” month. I love the flourishes with the die and the sentiments also. Thanks for the chance to win. WOW !!! I’m having visions of beautiful patterned paper. Am I excited???????????? Oh no…I will not be able to resist this month. I am just drooling over the scrapbook page. How absolutely beautiful! I need this set- and the dies! I love the Embellishments set in this preview. All the card samples are really wonderful. Thank you for a chance to win this prize package! Wow, so many exciting peeks in this first introduction. I can’t wait for tomorrow! Flourishes are my favorites! I love how versatile this set is for CAS and more elegant cards. Beautiful samples once again. Gorgeous set! I love all the different styles you can achieve just by using different colors–elegant, vintage, mod. And of course, LOVING the new dies! I’m a flourishes fan, and love the bolder style of this set. That die will be awesome–no more intricate cutting!! What a beautiful set! The die sets is such a wonderful addition to these designs which are time consuming and challenging to cut out well! Thanks for always thinking of us and saving us time on our projects!! when I saw the sneak peek, I knew this was going to be a must have. You just proved it. Can’t wait to use this set! i love how the stamps in this set have the abitlity to be combines to make ornate patterns or used individually as simple embellishments! I am in awe at the talent that you and the team create with each month! I am amazed how easy you make crafting for us! The stamp set along is amazing,(love, love the sentiments) but to add the die for it, I can’t think of anything better. Can’t wait to see what the other days hold! I love that one of the flourishes looks like a flower! It’s amazing how much just one flourish gives to a card. Great job, yet again! Oh my goodness….talk about a versatile set!! Love the cards! I love a good versatile set of stamps that can be used for both male or females and scrapbooking or cards. Great projects, stamps and dies. God bless! I am always blown away by the talent here! Gorgeous and wonderful stamp designs and fabulous and unique inspiration pieces! So many “must haves”!! I can see myself using this set over and over again. I would have thought to use this on feminine & fancy, elegant cards, but you showed how to make it masculine & clean/simple. It would be fun to win. Stamps with dies to match make me so happy! Nichole, you used felt and flowers on your page, lol; I think you are the first finisher of the August Papertrey Pages challenge!! I will definately link to your page at the end of the month! And of course, I hope you have ordered tons of the dies and stamps, because I won’t be able to order until Sunday morning, and I want them on my pages, too!! This will be the first stamp set and dies that I put in my cart this month! Beautiful and something I have been looking for. This is such a pretty set. Now that my kids are older, I find I am looking more for these kinds of embellishments, rather than the “cutesy” stuff. Thanks for sharing all of the inspiration! Wow! This is a look I’ve never seen before in a stamp set – how wonderful! Love what you did with it and your color combinations are fabulous!! Love all the flourishes!! Simply perfect!! Love this set, so elegant and classy. And the dies, bestill my heart, it will make cutting them out a breeze. The flourishes are gorgeous! I love how the die cuts them out perfectly. I love this new set – and so creative with the matching dies!!!! Thank you so much for showing how these stamps can be used with scrapbooking as well as card making! I told myself that I wouldn’t need another flourish set since I already have Fancy Flourishes. Silly, silly me. My favorite project is your scrapbook page. Beautiful. I can already tell the flourish dies and stamp set will be wildly popular…I’m loving it myself! I don’t know how you do it each month, but I always look forward to fresh inspiration every month. Thank you!! OMG, those sets and dies are awesome! I have recently purchased some dies, impression plates and borders and I love them all! Bring them on this month! TFS! WOW! SO many projects – so little time!! The flourishes have so many possibilities – a great set for the money!!! Once again another must have set. Love it and the dies too. I love PTI flourishes — elegant without being too frilly! This is a gorgeous set! I just bought some of your products for the first time at CHA (thanks for showing me around Nichole!) I really like how you make your own patterned paper & how the stamps can be used in so many ways – from feminine to masculine & everything in between. Thanks for a chance to win some great products! This set is very elegant! I would LOVE to win it. I also am thrilled about the matching dies! This set is beautiful and can’t wait to get it. The project that I loved the most is the scrapbook page. It is so soft and beautiful, I thought that it was done with printed papers. The sentiments are go wonderfully with the flourishes. And thanks for the tip of coloring photos with copics. That scrapbook page should be in a magazine! Gorgeous. I am so excited after seeing the projects today. I can’t wait to see more of the holiday images and all the possibilities that await! Love the flourishes and the other elements! Also love the sentiments too! Fabulous projects once again Nichole! A gorgeous set! I’m loving the new mat stack die too! great stamp set and the card are inspiring as always! Beautiful set! I love how you showcased its use on a scrapbook page as well as cards. Wow! This is amazing! I would buy this set solely for the two big flourishes so getting them with everything else is a bonus! Can’t wait to see what else this month holds! Wonderfully versatile flourishes in this set. Can’t wait to use on wedding papergoods. Wow! I love these embellishments! That scrapbook page is amazing, Nichole! Love all your projects, but my favorite probably is the fall one. Again I am so impressed with every thing you can do with this set. I use flourishes a lot in my card making. They add such an elegant touch. I love this set and the coordinating die is a great idea. Can’t wait to play with these new products! Oh my goodness! I’m in love…a must have for me. Wow, just when I thought there couldn’t be another flourish stamp that I would need–Voila! Fabulous, a must have set for sure. Thanks for the chance. I love the way you made your own background paper! I will try it out! Noew Flourishes are beautiful! This set is just gorgeous!!! I love the versatility of it. So many different ways to use it. Thanks for sharing your awesome samples. I have to get my hands on Fancy Flourishes. It is going to be one of those that I “overuse” – if that is possible?!?! Just beautiful…love the distressed look of the flourishes, the fonts are awesome and the dies are the best. Love this concept of stamp sets with matching dies…makes creating paper projects so much fun! Can’t wait to see more this week. Oh, and I love the Mat Stack #4, great shape! I am relatively new to PTI and just recently purchased Fancy Flourishes as one of my first sets. I love it and this new set has my name written all over it. I love the sentiments that you have showcased from the set. And the scrapbook page that you created is gorgeous. What a great set! Your cards are wonderful examples of this sets versatility! The patterned paper made with the large flourish is beautiful. I love the card with the aqua and yellows, and I always love learning new details like the rhinestones on the star. Thanks for sharing so many wonderful projects. I am in love!! This set looks incredible and everything you created with it is stunning!! Wow! I can see this set used so many ways! I love the way you used it as a background, and the dies sure make it easy to use as an embellishment. So many possibilities! Thanks so much! Beautiful set! You have done a wonderful job showcasing this set. Can’t wait to see more over the next few days! I’m so happy that it’s the 10th and we get to see samples using the new sets. All of your cards are so wonderful Nichole. And the layout is simply divine. I love that the images can be the focal point or a background. Great job! I will definitely be getting this set! I love that it can be used for both cardmaking AND scrapbooking! The number of uses is infinite! Yay Papertrey!!!! I love your scrapbook layout! At first glance I thought that was patterned paper. Very pretty! This new set looks fabulous. Love all the different looks you were able to make with it. What a fabulous way to kick off the best time of the month! I have always loved the antique look of bold flourishes — in fact, my couch is a sage tone-on-tone couch with the same flourish showcased in your 1st sample. I love the variety of ways your samples demonstrated they can be used. Wonderful! I especially love the album page. I need ideas for incorporating stamped images into my scrapbooks and this post was very inspiring. Wow, I am SO in love with that scrapbook page! It’s gor-geous! And the colors are pretty fabulous as well. So delicate, so feminine, and perfect for the picture. Love all of those flourishes! And the matching die, too! This set would make beautiful wedding cards! Love it when there are dies to match. You know what they say, life is good when you have all the tools! Thank you!! Gorgeous! That was my first impression when seeing the details of the flourish design. All the projects are beautiful. I love the scrapbook page. What a gorgeous flourish set this is! Totally love it! Goodness, those flourishes are pretty – and I am soooo happy to see the die for the large ones as well. Fabulous! I love it when PTI introduces a set that can be used across the seasons and for so many occassions! I would have never thought about a die for the flourishes, but I really like seeing the flourishes set off from the paper! What a great set! What an amazing set and so versatile! I love the projects that you made with the new Fancy Flourishes set. Looking forward to seeing the other August releases. I love the mix and match pattern building in this set. It looks like it will add great finishing touches. 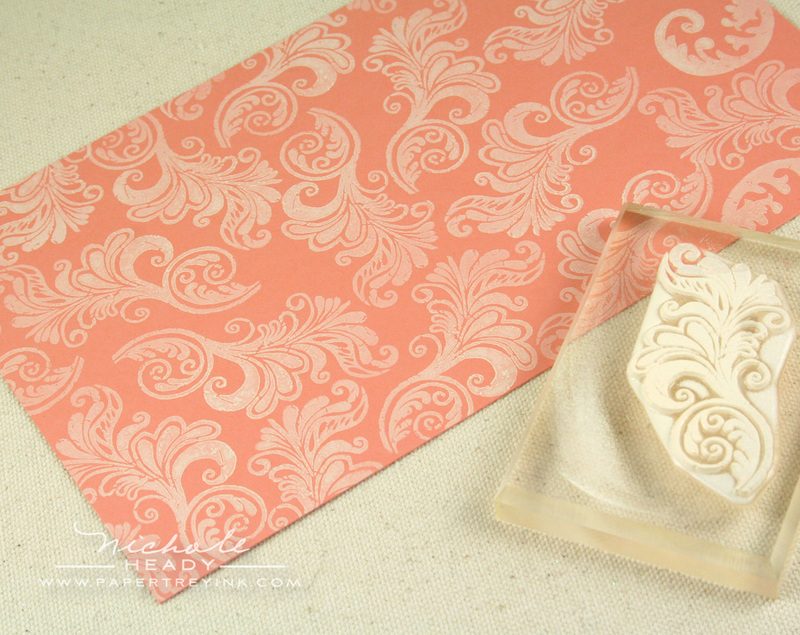 I love the patterned paper you created with it – it looks like fancy wallpaper! Great stamp set and LOVE the dies! Thanks for the chance to win. Wow, I am certainly loving the dies that coordinate with these flourishes! I have many ideas already zipping through my mind already, scrapbook pages, cards, treat boxes…and I am loving the technique of adding colour to a black and white photo. Ingenious! Fantastic-a must have for me! I’ve been sad over the end of summer, but your autumn card made me remember that after summer comes fall, the best season of all! What gorgeous projects from a great set! what a gorgeous set! the flourishes and all the little bits and pieces… WOW!!! love the die, as well… genius! Beautiful set! So many possibilities!! Oh, oh, oh! I love Embellishments! And I love the cards you’ve created with them. Beautiful set! I love the scrapbook page that you made to go with it and how you used all homemade embellishments and patterned paper. Love this! So pretty and elegant. Awesome set Tiffany! WOW! I would use the stamp set to get caught up on scrapbook pages of my 4 beautiful girls & I would offer to make thank you notes for my sister’s April wedding! I’m always anxious to see what you’ve come up with for the new releases, you never cease to amaze me and these sets definitely fit. I was feeling under the weather yesterday & just before I went to bed I checked my front porch and there was an order from Papertrey, I immediately felt better & can’t wait to use my new things! Thanks for all you & your teams inspiration and fabulous dies, stamps and all those things that make my life happy! Awesome projects & wonderful stampset! Can’t wait. What a great release. Love the accents. What a fun versatile set – I love how your dies coordinate and that it can be used for both a masculine and femine project. Your samples make me want to buy every set that Papertrey releases! Love the layout, I’m just starting to incorporate stamping with layouts and I really appreciate seeing how other people are doing it. Love it! I think flourishes looks great in every season and on every type of card. What a beautiful set….and so many possibilities! I am excited to see more. Thanks so much for making a die to go with the embellishments set. My old fingers thank you, and I can’t wait to add this set to my collection. Love this set! So pretty! And I love how you used it for a masculine card. That opens up so many different possibilities with this set that I wouldn’t have thought of. And to have coordinating dies, awesome! Love the great sizes in this set & I always love having matching dies! Wow!! Just. Wow. You never never never cease to amaze me. THis is absolutely GORGEOUS and you’re right about it being the next MUST HAVE set that every stamper needs. And the dies….swoon!!!! I love the little image that fits within the jumbo scallops – lovely! lovely, elegant, versatile! What a useful set. *GASP* This is definitely going to be one of my new favourite stamp sets. Without a doubt. AMAZING!!! Embellishments is absolutely stunning!!! I especially love your scrapbook page, Nichole! It is just my style!!!!! 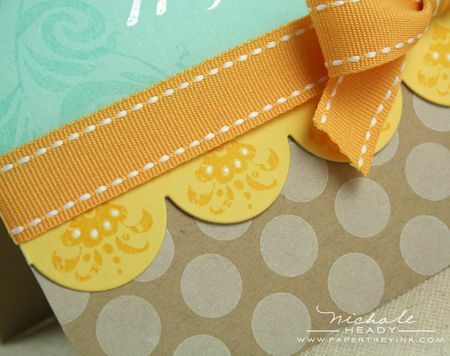 I love that you can cut out two embellishments with one die. One flourish will almost never be enough. This just cuts down my time again. Beautiful set, so versatile! My first impression of this set was it’s elegance and beauty. I love the way it can be used to created backgrounds, embellish a card while using another set, create a frame or even a focal image. Love the die with this set. It really increases the versatility! The stamp set is super fun! I love all of the samples and color combos you have going on! So great! I wasn’t sure I needed this set from the sneak but now that I see some things to do with it I know I need it! Six projects! Nichole, you are spoiling us! They really show the versatility of the set. AMAZING projects. Love the matching die cuts! PTI is the best! This set is so different from Fancy Flourishes. I love how Tiffany has achieved such an elegant look with the bolder images. And the sentiments & dies are just icing on the cake. I can’t wait to order these! This set is AMAMZING! So many possibilities!!! I can’t beleive the background you created and I love the dies for the flourishes. Makes it so easy to use! I love the coordinating die with the 2 big flourishes. I can see using that over and over in my scrapbooks. Cute ideas this month! Gorgeous set!! The coordinating dies are awesome! I just adore that scrapbook page. . .the patterned papers you created there are stunning! So versatile! 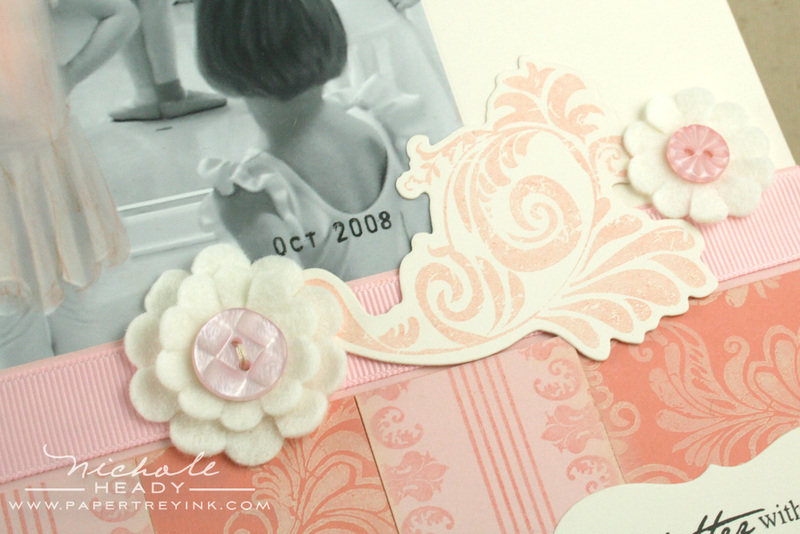 Your projects are gorgeous – I love the softness of the ballerina page and the warmth of the autumn card! Oh my word!!! I am speechless!! I love all the different ways you can use this! So beautiful! Love how you were able to create the rich look of damask fabric in the LO with Hannah’s pink ballerina outfit. I just love the sentiments!! How beautiful is this set! I love the fact that you can make background paper from it, and so many other things. You always do an awesome job on your projects Nichole, you bring out the true beauty of every product you show. Such a great set, so feminine and sophisticated. This will be a great set to add to my growing collection! LOVE this set! You can’t have too many flourishes, I say. And the sentiments are adorable too! I love all of today’s projects, really shows the versatility of the set! When I saw the first layout, I knew I’d like to use the set and die for all the heritage pages I am wanting to do with my mom’s old pictures from her childhood. (I knew I was waiting to start those for a reason, I was waiting on this set! LOL!) But, after seeing all the projects you’ve done, I know I can use it for so much more than just the heritage pages! I can see using it for all kinds of layouts! I especially love stamps that you can use for scrapbooking, and not just cards, so this one’s definitely going on my wish list! I am always amazed at how you can use one stamp set in so many ways! Thanks for showing us just how versatile this set is. It’s lovely! What a diverse set and dies too! The Thank You card is my favorite, simple but elegant. Beautiful, as always. Love the sentiments. Wow Wow Wow-what a beautiful stamp set. Love the flourishes, remind me of old time romance. Again thank yiou for sharing your many great projects. Love, love this stamp! I can use this in practically any project … Another must get! Wow. This set and matching dies are a “must have”…it is really classic yet surprisingly versatile. Looks like a GREAT set! Love that the flourishes have a die to cut them!! Love the little flourish flower…so great! looks like a perfect all around set…backgrounds, accents, main, plus some words! Great job! Oh, I love this set! You can add just a little extra oomph or make it the star of the show! Yay for a die! I wouldn’t want to fussy cut those flourishes! And yay for an image that fits the large scallop! I love it when new stuff coordinates with things I already own! Looks fabulous! Love all of the creative inspiration. I love the sentiment used and how fancy the flourishes made the frame…thats my favorite! Your scrapbook page is absolutely beautiful. As always, you are an innovator in the field. I can’t wait to see what is to come in this release. This is amazing! I love the dies with it. Way to go on the simple Thank You card! I love it! This set of flourishes is just what I need to help me make vintage style cards and other projects! Your scrapbook page is just beautiful! I like this flourish set. I think that making background paper is so elegant looking with this style of background along with many other uses. OK, you have me again! Just when I think that I shouldn’t buy any more stamps for a while, you release another beautiful set that I just have to have! Oh Wow! Another great set and it is only day one of the countdown! Wow! Yet another unique set and the possibilities are totally endless. Love all the examples and cannot wait to get this set. Keep the matching dies coming! Wow! What a great set and very fun projects. I love the look of this set!! And the coordinating dies, love it!! Beautiful!! I would love to add this to my collection!! Thanks for the chance to win it!! I LOVE it! I love it has the die that works with it.. no hand cutting for me! LOL!! I cant wait for the 15th! Off to the rest of the DTs pretties! WOW! I’m thinking I’m really gonna LOVE this set. I can’t wait to see all the sentiments that come with it! A great job again with the inspiration! I can totally see the potential with this set! Limitless!! I’ve traded card making for scrapbooking more in the past year and this is perfect!! Another lovely set with so many looks that can be achieved. I love having the coordinating dies and think it will be fun to use it in conjunction with the new Mat Stack die as well. Are you kidding me? This set is awesome and every project you created with it is making me drool! What a classy and versatile set. The flourishes, dies and borders are enough to merit a place in my cart. But, the sentiments put me over the edge. Love the font. And I’d love to win this. So much versatility! As always, your cards are beautiful, Nichole, and really show off the endless possibilites these new stamps/dies provide. Another “must have”! Beautiful! I use Fancy Flourishes set often and love it. This would be a geat addition to my collection and provide more choices. I love the die cuts, as I do all your die cuts! I can’t wait to get my hands on this stamp set and begin making beautiful cards. It will be perfect to use for male themed cards. Thank you for another great set. Wonderful artwork! Congrats Tiffany for an beautifully designed set! I agree this will be a must have set that I reach for on a regular basis! I just love the dies for the flourishes, such a fun idea! Nichole you have shown how versitile this set is! I love all your projects and especially love that you are using them in scrapbooks. That is just the nudge I need to stamp in my scrapbooks more often. Thanks for all great inspiration! Looking forward to the rest of the week! I love all of your projects! I love that this set is so versatile. Wow! I mean really – WOW! I love all your stamp sets! This is a MUST HAVE set! You have done an amazing job showing us it’s potential – Thank you! This is a must have use on almost every project set! Incredible! I didn’t need to go beyond the very first “wallpaper” scrapbook page to know that I cannot live another day without this beautiful new flourish and sentiments set! I gasped. I sighed. I oohed and aahed my way through all your exquisite projects. Thanks for all your elegant inspiration. With love……. WOW! I have never been much of a flourish person, but I was floored by that homemade DP you created inthe first card and now I want this set, and I haven’t even seen it in its entirety! Thanks for a chance to win! Wow, I love these two sets! The flourishes look so fun and the embellishments set seem to coordinate with so many sets that already have! I’m looking forward to see the whole set! Wow! I just love flourishes! But this set is soooo fantastic! And dies to go with it! I have to add this to my wish list. I love all your sample projects- especially the scrapbook page-You are super talented. Love the new flourishes, especially with a die to cut a couple of them out!!! I’m looking forward to adding this to my collection. What elegant flourishes and the font of the sentiments is gorgeous. Thanks for showing all the possibilities. The background paper is superb …. excellent job highlighting this amazing set, Nicole. I am impressed every month with the new ideas and your creative flair in making them come to life on cards and scrapbook pages. I can’t wait to see what the design team does. it’s MY favorite time of the month. Beautiful flourish and die set! I love the scrapbook page you created for your sweet little Hannah – that page is simply gorgeous!!! Your samples are amazing! Can’t wait to order this set! What fabulous examples, Nichole! I love all your projects and appreciate how you’ve shown such versatility! These might be my first PTI dies! Wow, what a great set! I love flourishes, they can add so much to a space that needs that little touch of something extra! I really like the sentiments. You and your team have such a knack for picking out great fonts! Once again, I am amazed at your talent. You know how to work a stamp set! These are gorgeous samples!! I love them all! What a classy, elegant stamp set! Simply beautiful. Flourishes are missing from my stash, so this would be a great addition! Versatile too – gotta love it. Oh, this set has so many possibilities!! The matching die completes the set perfectly! i love all of the projects. these two stamp sets are great & i love the co-ordinating dies. it’s a bonus that they can be used as a focal image or we can use them as backgrounds. thanks. Wow! This set looks so versatile! I can’t wait to see the full reveal. how awesome! The pattern paper ideas are endless! I love the look of this flourish set. So elegant or fun or classy or whimsical… whatever you want it to be. So many ideas are swirling around with this set! I can easily imaging fantastic swooshes behind butterflies, kites or planes! I love the sentiments I have seen so far, as well. Great set! I love the flourishes and love that you made a die set. Appreciate seeing the great examples. My favorite is the masculine one. Beautiful. 😉 I need me some flourishes, and these are absolutely beautiful. What a great add on set. I just love all of the options. LOVE all of your projects! Thanks for the chance to win all of these fabulous items! Wow, that looks like a must have set! Love each one of those cards/ projects you made with it!!! I really like how you coordinated the dies to this set. I also love how you have flourishes that appear to be mirror images. I am a person who loves symmetry. 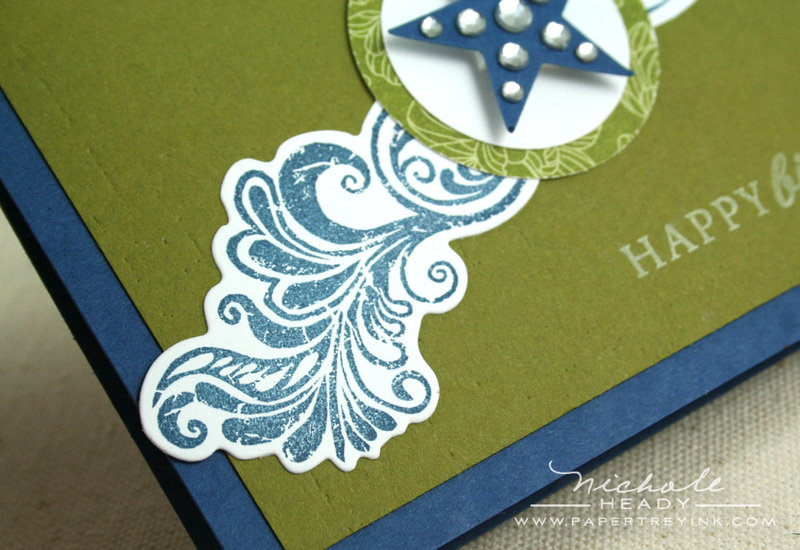 What an awesome idea that was to create matching dies for these flourish stamps. I often want to cut them out but the time involved sometimes is too much. Beautiful samples in showing this stamp set. I love “type”, so the sentiments really jumped out at me. Loving this set!! I love, love, love the coordinating dies!!!! What a beautiful set! Also, that blue, yellow, and kraft card is absolutely gorgeous! Simply beautiful! I can’t wait for the release. So many beautiful looks and color combinations! I’m always a sucker for a flourish, particularly when they’re not used in “fussy” ways! Having the die is a real bonus — I can’t say that my cutting skills are all I’d like them to be, lol! So beautiful and romantic, but loved that you showed a guy type card too! Great set. I would not have considered flourishes as a set for myself… until I saw this one. How versatile it is as a background stamp and with the dies, as an embellishment option too. I really like how the large scallops were stamped. Pretty cards. Beautiful embelishishment set! Especially love the scrapbook layout example. Stunning, as always! I LOVE that you are showcasing scrapbook pages lately as well — adorable! What a great set and I totally appreciate the fact that you showed how to use it in so many types of cards! I love this set. Today is my sons Birthday. He is 3. The boy card you made is great would love to have it now. Can’t wait. My first impression: can you say LOVE at first sight?!!! This is a MUST HAVE set for creating my favorite classy/elegant style of cards. Wow! I love the coordinating dies with the hard-to-cut flourishes. 🙂 Wonderful! This is a must-have set. I love that you made a die to go with it. Perfect for scrapbook pages and cards. Love it! Wow, those flourishes are so beautiful and elegant and how cool is it to have dies for them! PTI always come up with new and exciting items! Love that there’s a coordinating die for this set. Looks like it would be a great addition to my collection! Your scrapbook page is amazingly beautiful. Coloring in Hannah’s dress was the accent that gave it the over the top excellence. This is a “go to” set for me and thanks for the coordinating dies. Super! Ah, this set is lovely. Beautiful cards too. Wow! What a super set of embellishments! This could be used in so many different ways! A definite must have! What a fun set! I know with the die it will become one of my favorites!! Thanks for all your inspiration! Love it! What an incredibly versatile set! The coordinating dies are brilliant, and I love the combination with other sets like the background stripes, and the use of the new Mat Stack die! Can’t wait to get my hands on this. What a beautiful set. I love how you can use it formally and casually. OMGoodness! So many great samples!!! I love the scrapbook page and the fall card the best! Though the rest are also amazing!! I thought I could do without this set, but I’m not so sure anymore! I don’t have a Flourishes set of stamps so this is really appealing – I love the color combinations here! What a great set! I love the coordinating dies, too! Oh my! What wonderful examples and I love the color palette of each one. The designer paper you created with the flourish is so beautiful. Thanks for the chance to win this amazing package of goodies. Stunning! These embellishment images are gorgeous. Your scrapbook page and cards will help me venture out and explore vintage. You’ve made it look easy and the results are simply beautiful! Thank you! Love the fluorishes in the set! Oh please oh please oh please let me win! I’d love to win this set, I think i’d add it to everything!! I love the flourishes and small details. I can’t wait to see what the sentiments are.. WOW! Great new addition to the PTI fabulous creations. I could have used it for 2 wedding cards I am working on now. It will be fun to mix with many other sets. I love it! Anxious to see the others! I’ll be honest, in the sneak peek i thought “ok another flourish set”. BUT today’s post shows that this just isn’t so. I LOVE the layout you created and the fact there are matching dies!! This is a must have set. Gorgeous new set! I love the elegance of it along with the slightly distressed appeal of it as well which makes it very versatile (especially with the matching die). Amazing projects showcasing the set too! Wow! Love Embellishments! Looks like a new favorite stamp set! Love this set. And the dies!! Gorgeous. This set is unlike anything I already have…might just have to get it for that reason alone. That flourish looks really useful and fun, especially as a background. Such a versatile set, I love the projects shown! What an amazing idea. I always love the look of a cut out flourish but I never have the patience or cutting skill to do a good job with it. This makes it easy. Oh my goodness, I found you a few months ago and now look forward to every release. I have the dates for the previews marked in my calendar!!! I love the inspiration you ladies provide! Well Nichole, you and your team never cease to amaze all of us. The Embellishments set and die will be a must have for me. Thanks for helping me spend my money. What a gorgeous stamp set!! I love how you created the frames, and the scrapbook page is wonderful! Please pass on my kudos to Tiffany! Can’t wait until the 15th! Fabulous, as usual! I especially appreciate seeing the use of a black pen and the scor- pal for added emphasis. It’s those little details that really make working with your stamps joyful and fun. I absolutely love the flourishes and coordinating dies. Great projects! Beautiful, graceful stamp set. I can see myself using this over and over again. Paper backgrounds, cards, tags, decorating gifts bags. So great to have the cordinating die too! What a beautiful set! I love the coordinating dies! And what simple but fabulous cards! All of the cards are so gorgeous! The flourishes are so elegant and modern. 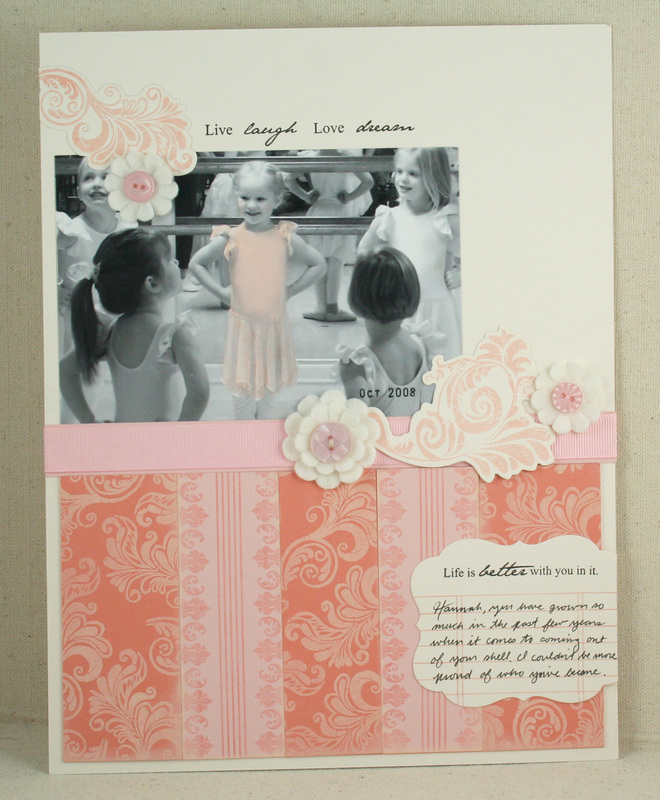 They add so much femininity to the ballerina layout! A fantastic addition to the PTI lineup. Love the new set. Once again the design team has done a fantastic job. I didn’t think I would need this set but you proved me wrong! Oh Nichole! I am totally amazed by all your projects today. I am so happy that you’ve made a die for the flourishes as I am not too proficient at the detailed cutting. I really like your masculine card and I wouldn’t have imagined how to use this set for a masculine card. Now I know! Thanks again for including older sets and tools in with the newest! What a start to the new countdown! Can it get better than this?? This set is fabullous! LOve the coordinating dies too. I love the border and the way the small flower goes in the scallops. 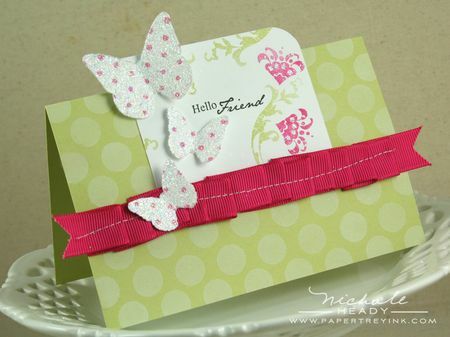 Those create such a dainty, lovely detail on cards and scrapbook pages. I really enjoy seeing your use of stamps on scrapbook pages. I need the inspiration. 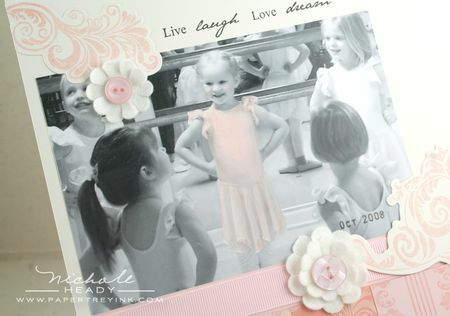 Gorgeous ballerina layout in my favorite color – soft pink. This flourish is a must have on my list. What a gorgeous set! Love the flourish and matching dies!! My fave is the Thank You card – love that color combo! This is a beautiful set that fills a definite need in the PTI lineup of stamps. Love your cards. 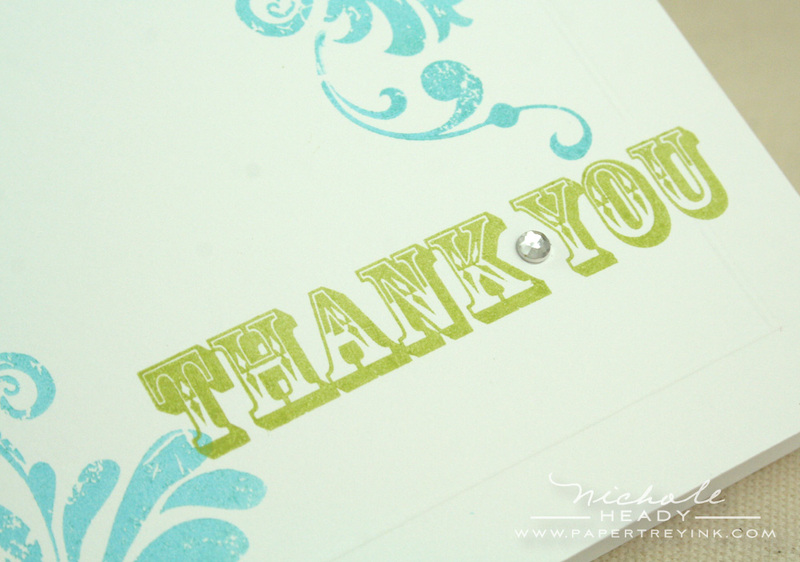 Nichole, I can’t even begin to tell you how your creations made me feel, I think I’ve died and gone to stamping heaven!!!! Amazing, simply amazing! Fabulous sets! I’m very excited for this months release. I’m totally in love with the flourishes and the font in this set. Thanks so much Tiffany! Love, love, LOVE this set, and with the coordinating die? This will definately be in my cart on the 15th! Wow! What a way to start the release off with a bang! Each and every project is fabulous. You really showed the versatility of this beautiful set!!! This new set will be a “must have”….a set that will be used over & over again. I love the samples that were shown today….this will be a very versatile stamp set. I so love it when you show all the different ways to use all the stamps in a different setting. I am learning how to think differently on using the stamps now. Enjoy all the dies that you are coming out with. Keep up the good work. Awesome set! So versatile, I just love the coordinating dies! This is a must have set! The flourishes from the Embellishment Die set will soon replace all the flourish sets I currently own. It is so versatile and beautiful! I can’t wait to try my hand at creating gorgeous backgrounds with this set! ~~Beautiful Projects~~ Flourishes have always been a favorite of mine, lending themselves to adding just the right accent or embellishment where needed. Again, matching dies! Another sure sell-out for PTI! This set can be used with anything! I can’t wait to see the whole thing! I am in love with this set! I love the scrapbook page and the beautiful cards. I can’t wait to see this fabulous release. The classic simplicity of your thank you card is stunning. can’t wait to see more. I love the distressed flourishes in this set, as well as the beautiful accent images! And the die cut??!! Divine ! I totally love this set, and I love that you have made a co-ordinating die to go with it, how awesome! My Mom’s 70th birthday is coming up and I can really see some pretty cards using this set. Thank you for the chance to win. I knew when I saw the sneak peek I had to have this, but now with the die too… it will be the fisrt thing in my cart! I see what you mean about not being able to live without this set…incredibly versatile and can be used with just about everything. Love the ideas! This set looks terrific! It has a wonderful distressed quality while still being very elegant. I loved the projects you showed! It combines the simple and clean style that I love with the worn shabby chic that I’ve been meanting to try. Thank you for the fantastic inspiration. Oh My Word!!! I JUST GOT TO HAVE this set… it’s stunning and the co-ordinating dies make it a bigger must have… soo beautiful!!! Thanks for inspiring magnificent cards!!! 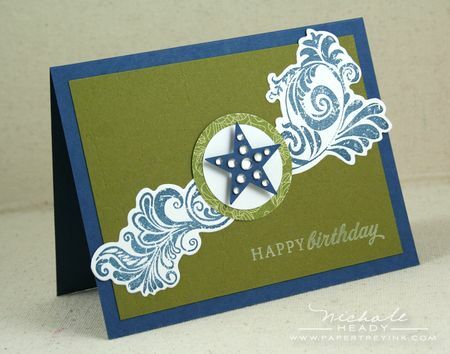 Such a lovely flourish and the die cut to coordinate is a very nice touch! The frame built on the fall card is just incredible. Like the shape interpreted as a flower in the butterfly card as well – very different. Definitely a must have set! Wow, wow, wow. MUST have this set! It looks beautiful and so versatile! Wow Nichole, he scrapbook page is exquisite! The combination of pinks with the black and white photo is really stunning! Wow, you are so talented – I love your projects! The new items you showed us today are awesome! I love flourishes and to have a die to go with them, how fun!!! Thank you for all of the inspiration! This is a gorgeous set, and I love the cards you have made with it! What a great set. This will make beautiful backgrounds as well as focal images. Oh my goodness! This is fabulous! I love the flourish and matching die! How…..well, fabulous!!! How elegant! Just perfect for all the fall weddings I have coming up!!! (Well, not MY weddings, but weddings I will be attending 🙂 LOL. Thank you for all the great new goodies! 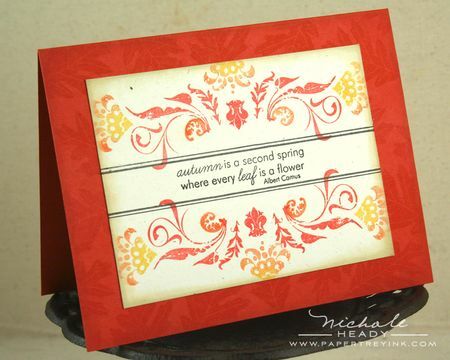 Those flourishes are beautiful, and I just love the idea of the coordinating dies! I adore the scrapbook page you made, and your cards are gorgeous! Everything happens for a reason. I have been waiting to buy a flourish set and now I know why I have waited. This set is gorgeous. Great job Tiffany and Nichole. Oh, I love the dies that go with the embellishments, that is too cool! I love your scrapbook page created with the new flourish set! The embellishments you created look like the expensive ones you purchase, only better because you can make them any color you would like — what fun! This new set is sure to be a favorite! Another fabulous set and I love when you make dies to match! I love the idea of coloring the photo with your copics! And the flourishes + die sound awesome! The big flourishes are beautiful! Love the scrapbook page! First impression is WOW!!! I like all the examples especially the paper you made on the scrapbook page. This would be a great set to use to make Thank You cards for a friend of mine that has a daughter getting married. I could use her color scheme! I’m mad for flourishes! I spent a year studying in Bordeaux, FR and I’d love to get this set and go back and make a new scrapbook – quels idees! Great set. It looks so versatile and perfect for scrapbooking! What a great new set and matching die! I love your samples and would love to try them and use them as a springboard for endless different ideas with this set. Oh wow! What a beautiful set. It looks like a must-have for sure! Each of your creations are just gorgeous, as always. Ah, another elements stamp set, one that looks as though it will have to sit on my table next to Fancy Flourishes as another “go to” set. So gorgeous and well thought out(ah, the stamp that fits perfectly in the scallop, oh my!)!!! I can’t wait to pair this with Tiffany’s set from last fall to make Thanksgiving cards (eh gah! is it THAT time already!). Woo hoo! Another wonderful start to a PTI stamp reveal! Love all your sample cards, they are so pretty!!! I can’t wait to see the whole sets. God bless and thanks for the chance to win. oh this set is just beautiful! I love the vintage feel of the flourishes and how they are distressed just a little bit. I can see that this one would be hard to put down. I always learn something from your posts! 2 things that really caught my eye this time were the small polka dots and glitter on the butterflies…pretty…and the use of Copics on the photo. Who knew you could do that?? That scrapbook page was simply wonderful. Thanks for sharing and the opportunity to win a prize. Wow! I love it… I didn’t want your post of samples to end. Thank you! thanks for showing the scrapbook page. I absolutely love that flourish and having the die too is awesome. I will definitly be getting this set & die. This set looks like a ‘must have’. Your card samples are stunning as usual! Oh my goodness, this stamp set and coordinating die are so what I have needed! I can’t think of just one type of card I would use it on as I would use it on everything! Oh my goodness! What a lovely set and the dies to go with it!!! WOW! Reminds me of wall paper…..
Looks like we can use for both feminine & masculine themed projects. I can’t wait to ink those beautiful flourishes! This set is so elegant. It reminds me of the red velvet flocked wallpaper from the 70’s. I love it. What a fantastic new set! I love the variety of styles you’ve shown us! As usual, I’m not disappointed and this is a must have. I need a Flourish stamp set and hoping I’ll win it, but if not, it’s one I’ll have to have. The projects you have created blow me away. Thank you for all the inspiration your blog gives me. That is a great idea! I love the flourishes! The coordinating dies are what have sold me on this set. It is sooo time consuming to hand trim flourishes. Having the dies make such smooth and perfect cuts totally appeals to the perfectionist in me 🙂 The samples today are gorgeous and I love the sentiments on the scrapbook page! Oh wow, just love this set! What a beautiful layout and patterned paper you created. The embellishment as a flower stem was my favourite part! I didn’t think I would like this, but your samples are terrific! I love the variety of looks you have achieved with this set. Yum! All those flourishes and the coordinating die are wonderful. Love all the different looks you showed us today. Ohhh I love Fancy Flourish already. Your creations with this set are so wonderful…. I always look forward to your releases, it must be so nice to create something which makes so many persons happy. Wowza! Another amazing release and gorgeous samples. Can’t wait for the 15th! Must have the Embellishments stamp set and matching dies – they are INKredible! 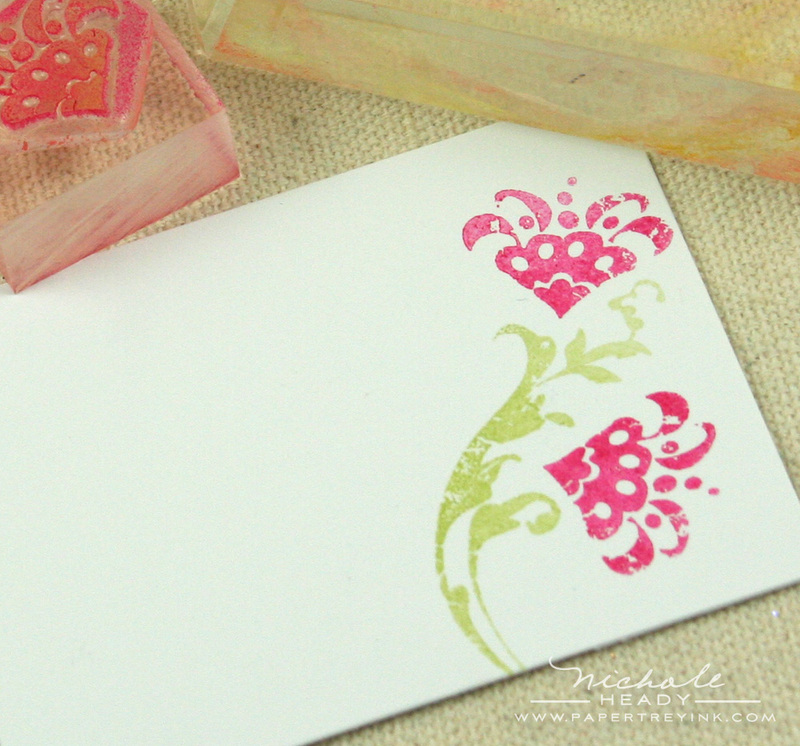 You’ve certainly shown me there are many ways to use a flourish stamp! I love your many ideas! What a great set. What a great versatile set. That layot is just fabulous! Hope I can win this set!! I love that project on Terracotta Tile. I need to use that color more often. What an absolutely gorgeous set! This is definitely one I need to get my hands on. I love that large flourish as a background! Swoon! I have searched for a versatle Flourishes stamp set for such a long time, and I just love the depth to this one, and of course the dies are a must have. You are a genius!This would be a go to set for any and every project. Thanks again for such wonderful inspiration! Oh my… this may be my all time favorite set yet! Love that there is a matching die. Love flourishes and the dies make things so easy! I really like the distressed look to the flourishes with this set and the size of them. Love the matching die also. Another great set PTI! All of your examples are so different and you’ve done a wonderful job showing the versatility of this set! I am looking forward to using this for formal occasions and even thinking this would make some wonderful Christmas cards too! Thank you for the chance to win! So many possibilities with this set. I love when I can easily use a stamp set for cards and scrapbooking. Great samples! Your scrapbook page just blew me away! This is a beautiful set that will definitely have a home with me very soon. Love it! What a fabulous set. Your showcase of projects is amazing. Love, love, love the matching dies. What a great basic set to achieve so many different looks! Your scrapbook page was stunning. I especially love the sentiments included in the set and the coordinating dies to make it all come together. I love making my own backgrounds rather than using patterned paper. These sets will be a great addition to my increasing Papertrey collection! Can’t wait to see what else is in store! I just love how vintage the swirls look.. it’s definatly a set I must get my hands on..That layout of yours is fab.. just fantastic!! What an extremely beautiful stamp set! It can be used in so many ways!! 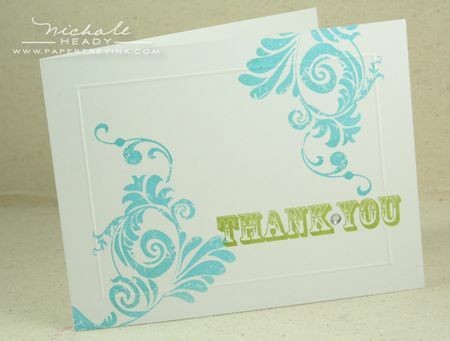 I just love the CAS Thank You card that you made with it…so fresh and clean and the colors are fab!! Beautiful work as usual. Love everything in this set. Excited for the rest of the reveals! Beautiful set! Love the dies! The scrapbook page you did, Nicole, is beautiful; but I always love the samples you make to showcase each set! Can’t wait for the 15th! Oooooooo – so pretty! Thanks for the chance of winning! This Embellishments set is definitely coming to live at my house! 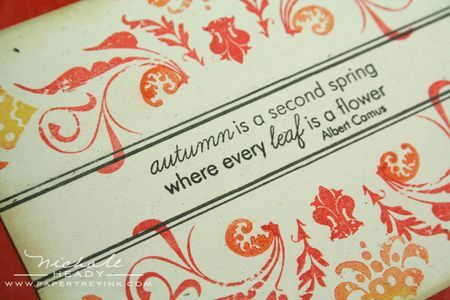 I just love the last 3 cards you showcased today – Autumn, Thank You and Star. Looks like yet another great release (of course), so thanks for the chance to win! Wow. What a great set. I would love to use this set on some of my scrapbook pages. The page you created was wonderful and left me full of inspiration. Great new set with dies to match…what could be better! Cute stamp set! I like how different it is from what I’ve seen out there! Great set! I love that there are die cuts, making this an extremely versatile set!!! Pretty! This will be a great multi-purpose grab all the time set! I love the background paper you made with the large flourish in white ink! Gorgeous as always and I can’t wait to see what’s next! Gorgeous flourishes in this set! I love the variety of projects you’ve shown us here. Love it! As always I love the coordination of dies & stamps. I soo never would have thought about a masculine card but you showed me that it can be done! Definitely must-haves! This set & coordinating die are something that I will be using over & over. I love it! This set will work so well with the baby shower, announcements and thank you’s I am making for my neighbor’s new bundle of joy! I love the set. I also love the coordinating dies. Another winner! Another classically beautiful set! You continue to out do yourselves! gorgeous set! i love all the different ways you used it. i can see myself creating many an elegant background paper with this set! Wow…What great projects! So many possibilities for this set…and the matching die! This is going to be a must have set – beautiful! This idea for the precise cutting of the flourishes with a metal die is really a breakthrough. Our cards will look even more professional now!! Cannot! wait! Wow are we going to have fun!! I love the variety of projects you used with this stamp set. Thanks again for all your great inspiration. At first I was thinking – another flourishes set. Thankfully I don’t need another one…and then I saw all your cards and your beautiful layout and I’m sold! I DO need another flourishes set. Thanks for sharing your beautiful work. Gorgeous projects! Love those fancy flourishes! I adore the ballerina layout – stunning! It’s like you read my mind, or Tiffany did!! I was just thinking that a nice rustic, thick, masculine flourish would be a perfect addition to my clear stamp set!! Cool – it is here!! I am totally crossing my fingers for this prize!! I adore all your projects, can’t wait to see what else you have in store!! My favorite project is the scrapbook page. I love eventing about it. The handmade DP, the journaling card, the ribbon and the Copic’d photo. Wonderful. I am looking forward to using the sentiments in the set too! Wow, I didn’t think I’d like this flourish set at first… it looked a bit too vintage for my stamping tastes/abilities. But of course, after seeing your projects and all the different ways you’ve used it, I’m blown away! I’m a sucker for background stamps, and I love how you’ve used the flourish to make various backgrounds that aren’t overwhelmingly flourishy. Also, that flower, and that gorgeous frame?… they may have made me squeal. 🙂 Loving it! Hi! I have already started my “Must Have” Papertrey list for August!!! I love flourishes and also look forward to the dies to cut them out. My favorite card is the Autumn Card. It is so beautiful. The colors and design are so pretty together! Can’t wait to see this set in it’s entirety! Thank you! 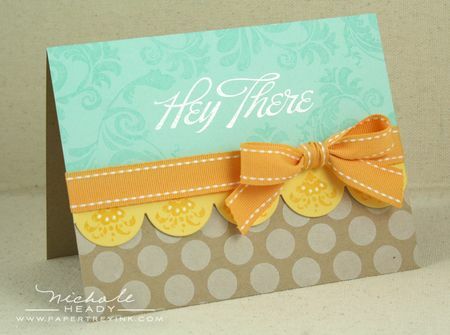 The Embellishments stamps and dies are to die for! I love the samples in this post!! I see this stamp set as being a great tool for Heritage type projects. Beautiful stamp set. Love that is has dies that match! flourishes are so versatile, but sometimes it’s hard to find the right flourish at the right size and swooping in the right direction. This looks like a great set of options… I love the details in each one. I don’t even know what to say to you anymore, Nichole! These projects today are amazing and I love how you are showing us scrapbooking layouts along with cards. It makes me feel like I am getting more for my money! I love to do both and you are making it so dang easy and fun! This set looks absolutely gorgeous and I LOVE that there’s a coordinating die!! Your cut out flourishes look like printed die cuts you could buy at the store for much more than it costs to make it yourself! And I love that you used it for a masculine card – what versatility! I didn’t think I needed a flourish set until I saw this. Love everything you made, especially the layout. I love this new flourishes set!! This was going to be the month that I bought no paper products, packed everything into boxes ready to move. Only the first set and I am in love! I love the veratility of this set. It will mix with so many of my PTI sets to make incredible backgrounds. At least it comes in a box ready to toss on the moving truck, right? Justify is my middle name! Gosh, this is such a lovely stamp set! Thanks for sharing! A girl can’t have enough flourish stamps…that’s my motto. I am so getting this set. This is a much prettier set than I anticipated from the sneak, and the dies make it even more exciting…Love it! Amazing! I particularly love the autumn card. Embellishments will soon be joining my PTI collection! I love anything with flourishes and this set would be a great addition to my collection! You must giggle when you hear the buzz on the forum “imagine if there were matching dies for those flourishes” …. and then you whip them out and blow us all away :0) I love the sumptuous look of these – quite different from the Fancy Flourishes, which I’ve used a LOT, and so fitting for the fall/winter season! What a great start to this countdown! I love the sentiments that you included in the set. Also love that there is a coordinating die. Love it! Can’t wait to see what else you have in store the next few days. This is going to be such a classic set, that I can imagine using for years to come. Another ‘wow’! Thank you for your creative showcasing of this set. Flourishes rock! Thanks for the chance. I love this! I am so excited that dies are available to go with this set. I love it! The samples are fabulous, but my favorite is the one layer thank you card. I love simple and elegant! Looks like another essential stamp set to own! Can’t wait to see the rest of the images in this set! I’m loving it! I don’t own any flourshies… yet! Beautiful ideas, I can’t wait for the release! every month i cant wait to see what new things you will have in store…as always everything is always so beautiful…i will have to wait to see your other goodies before i order…hopefully i will win something and that will make my choices smaller…thank you for your lovely creativity…i truly enjoy it!!! Wow, wow, wow, I am so blow away by the pretty flourishes and how versatile it is. The font combination is indeed wonderful. I love love love your first pink scrap book page. so soft and elegant. All the details. Just too pretty. Six projects from one set and they all look so very different. Your wonderful work always overwhelms me and I can’t think clearly! I do know this – this set is a must have! Hannah is gorgeous and has a fabulous turnout. The scrapbook page is over the moon great. TFS. i love the elegance but distressed look. very nice! I love the autumn card that Nicole made. It is just beautiful. I love the flourish stamp set and dies. You can never have too many flourishes. Beautiful set..especially with the dies. I use my flourish set frequently, I can see this set quickly becoming a go to set, as well. Love the sentiments and the fonts used. I think it may be a must have. Holy cow! I am simply amazed how you guys have totally outdone yourselves once again! This set is fantastic. I love the variety shown here. I could see myself using this set on just about every card, scrapbook page or other project! I cant wait until the new release. I love new stamps and fall is my favorite season! Wow a lot of wonderful things can be done and made with this set!! I a sucker for flourishes and these are awesome. LOVE what you did with them too. I think This is the most amazing “pear” stamp very (new) trend(y). The flourish set with matching die is fabulous … can’t wait … must have!! Looks like another wonderful PTI release. So great to meet all of you PTI gals at CHA!! I think this is the most amazing “pear” stamp very (new) trend(y)! Loving all the fabulous samples shared on the blog today – awesome! LOVE this set. Like you mentioned, the possibilities are endless with this fabulous new set and matching dies. This is a MUST HAVE! Can’t wait. Thanks. This is a beautiful set and the coordinating dies are wonderful. I especially like the first project, the scrapbook page. Stunning … and I love the tip about using the Copic marker! Gorgeous, your beautiful harvest gold/summer sundrise/aqua mist card caught my eye straight away. We are still in the depths of winterhere and it looked like the bright promise of spring to me! What a neat new way to use my favorite PTI Flourishes set 🙂 Still trying to figure out how you come up with these amazing ideas !!! Love flourish ANYTHING! This new set will be a great addition to so many other PTI sets. Your cards are amazing, Nicole…as usual. You have such a creative artistic eye~your blog is always my One-Stop Inspiration stop! Your layout and its subject are darling. This set and the die look fantastic! I especially liked the autumn themed card and the simple crisp look of the thank you card. What a great set! 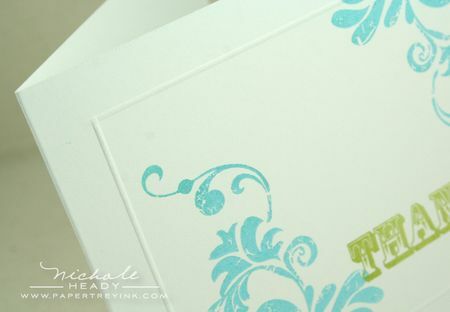 Love the versatility and those flourishes are wonderful, not to mention the coordinating dies! OHHHH this is the fab- I love this set and the dies. SOOOOO cute. Great samples. Oh WOW! This set appears to have sooooo many possibilities either used alone or with other sets. I cannot wait to see the complete set. All of your projects are awesome. I love the way the small stamp coordinates with the large scallop border die. Thanks for the chance to win this set and die. I like the flourishes, both large and small. The other parts of the sets will be very versatile to say the least. Thanks for a chance to win. I love the dies for the flourishes and hope you come out with dies for the fancy flourishes set! I LOVE that a scrap page was included in the samples this month!! I can’t wait to start using these flourishes on my pages! Oh wow, that first project looks just like old fashioned wall paper. Gotta love it. I appreciate how your projects showcase how versatile this set can be. I told myself I wasn’t buying any more stamps with Flourishes….but THEN I saw this one. Gorgeous, love the coordinating dies…can’t WAIT to get these!! Now that I am finally set up to use the dies, I really appreciate that these are a great addition to the sets at release time, and these ones are particularly cool, because I am not sure it would have occurred to me to cut the images out otherwise. Thanks! I love flourishes and have load of ideas for these stamps and dies already. Thanks Papertreyink!!! first impression…a must have…i love all these swirls and curls! 🙂 so fun! Gorgeous! I love the simple thank you card. They’re all beautiful, but I really love how the Autumn card turned out! The Flourishes whth the die is simply AWESOME! Oh I can hardly wait – not quite finished unwrapping my July order, but YAY for these lovely flourishes! Beautiful colors, beautiful designs I think that says it all. Love the flourishes and the die. They’re so hard to cut out nicely and this makes it much more simple. This set is just beautiful! It will make great backgrounds. Love it! Can’t wait to own it! I’m always amazed at your creativity! LOVE that scrapbook page! Initially, I didn’t think a flourish set would be for me — but now I see how versatile it is…Gotta Have it!! Love all the samples. I am also loving the look of summer sunrise and aqua mist. Another fabulous stamp set and the dies are wonderful. I hate cutting out flourishes. This month is going to be a hard month to decide what to get. Wow! Love how these images can look great individually, or in creative groupings! And as always, a matching die just puts me over the edge… I LOVE precise cuts around gorgeous shapes! Did someone say flourishes? Oh boy, I love anything with flourishes. I think I have to have this one! Love the flourishes. They are so elegant and that is my style. Another great set from PTI! Very nice projects. My wife would be thrilled to win these. This set is totally amazing! I can imagine this will be a great seller! A total must have! Absolutely gorgeous flourishes. As you have shown, the possibilities are infinite. Can’t wait to get my hands on this set. I can see where it will spark creativity for everyone. Wow this set is Amazing!!! I would love to use it on cards and LO’s. Nice set and I really like the dies that work with the stamps. The projects were great and as always, it makes me eager to create. LOVE the idea of the flourish designs with the matching dies! Very handy! The layout with the b&w photo lightly colored with the soft pink Copic marker is exquisite! Way excited about this release! Looks like a definite MUST HAVE!!! Beautiful samples!!!! love the way this set was used in a variety of different styles, its so versitile!! Great job again by the amazing design team!! Gorgeous images. And thanks for highlighting a scrapbook page as well as the beautiful cards. My impression? The set and dies are gorgeous, and I can’t wait to play with them! I love love love the dies that match the stamp sets. 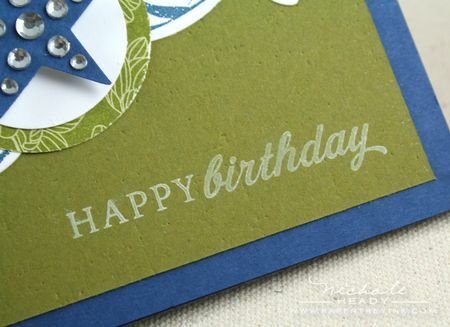 Flourishes always add a nice polished look to a card. Wow the use on this set on the background in the first lay out is amazing. Who needs any dsp when you can make a beatiful creation such as this. Absolutely love the simplicity, yet elegance, of your use of the set on the autumn card. How that could be used with different colors and sentiments for any occasion out there. OMG!!! i love how versatile this set is! Thank you for the different ideas- I love it! I love this! Having the die cut image makes me think I would definitely use flourishes more… I definitely use them now in my scrap pages!! Wow the set is awesome. Nicole, you are amazing with all the different ways you used the set!!! Looks like another set I am going to need it is just gorgeous..
Love these beautiful and elegant images! And I’ve always thought someone should invent a flourish die. Gorgeous! How exciting! This is the first time that I am seeing the sneek peaks and preview project ideas. This is definitely something that I will mark on my calendar for the upcoming months…love it! I thought there was one more day of previews and to my surprise this morning there were wonderful designs from the PTI team. I really like the Embellishment set and matching die. looks like another homerun of a set. can’t go wrong with flourishes and dies to match! who wouldn’t love this. Its a beautiful, versitile set! Kudos to Tiffany! Love the new mat stack die and also fillable frames the flourish is beautiful!! i love the melon and cream together on your first layout. so soothing. and i again love the color combo on your Autumn card. very striking! I absolutely love these cards!! I better save my pennies between now and the fifteenth. Love this set and die. I just love these, another great job. Love with the DT have done with them. Shut.the.door! You had me at ‘flourish stamped in cream’. WOW is that gorgeous!!!!!! Beautiful! I’m always amazed by the creative possibilities from the PTI sets. Oh that autumn would be the second spring…we can dream!! The florish is so wonderful paired with the die!!! 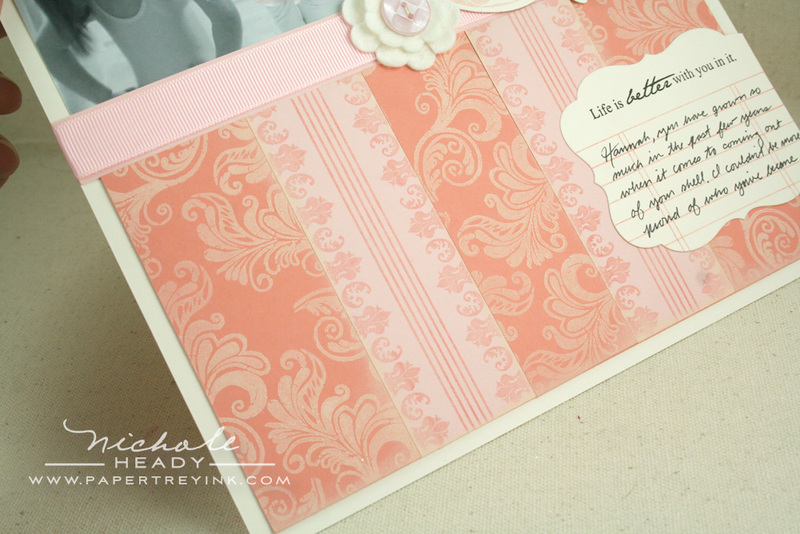 Love the background paper you made with the flourishes on the scrapbook page. So elegant! Will be a set I use often. Wow awesome samples. Love the dies that match the stamps. Keep ’em comin”! Absolutely beautiful!!! Can’t wait to have this set! I love seeing all your creativity with new stamps. Makes me want them all! So scrumptious…must get this set right away. This is a set that create simple cards and very intricate ones! I love that! ooohhh, I am a sucker for flourishes, this set is going to be gorgeous I’m sure! The new fancy flourishes stamps are very inspiring. It is very luxurious. The stamps make one think they are for a very important person. All your samples are incredible!!! I absolutely love this set and the dies! The flourishes are just beautiful, as are your projects. Another great month from Papertrey! I can definitely see myself using this for fall and Christmas/winter cards!! Another great release, I see! Love this Nichole and thank you for explaining your philosophy to me at CHA. The versatility of one set and how you showcased it is wonderful. Your design team and yourself never cease to amaze me with the talent on board. Love the autumn card and the star card. Great job! Flourishes are awesome! Thanks for the chance to win!! OMG I LOVE LOVE LOVE THIS SET! I SO CANT WAIT TILL THE RELEASE! I absolutely love this new flourish set. The dies are awesome. I can’t wait to use them to dress up some of my scrapbook pages and cards. Such a versatile set! This set is awesome!!! I love the dies!! 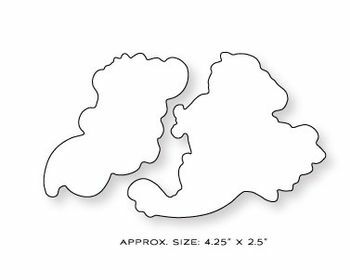 This set will be one of those that I reach for just about every time I go to make a card-and it will be great for scrapbook pages!! I am getting ready to start my San Francisco scrapbook and this set will be perfect! This is a beautiful set and so versatile! I can’t wait to see all the sentiments that go along with it. I love this set and the coordinating dies. I can’t wait to get my hands on them! Can’t wait to see more samples each day…your work is an inspiration…as are all the PTI gals! This is an absolutely beautiful set! It creates many classy, soft touches to projects. The ‘wallpaper’ creation is just gorgeous! It’s so nice to have dies that coordinate…perfect for that special dimensional look! Thanks so much for sharing these great ideas…. Oh I love flourishes – and to have a die to coordinate is perfect. I love your samples and how different each one looks. What a great variety you can get from one set. This is so beautiful! WOW! The flourishes are so fancy I could make elegant birthday cards, baby cards, thank you cards. The set is limitless. I can’t wait to add it to my collection of PTI products! Mat stack 4, you have me hooked can’t wait to see more!!! I LOVE the flourishes!!!!! I can’t wait to have this set. Love this set and love the dies – PTI and the Design Team always amaze me! The flourishes die is so unique! I love all the different ideas you showed with it too! I am always using sets like this to add the perfect touch to a project. So versatile this is the perfect addition to any crafters supplies. I love these flourishes. This will be a set that you will reach for time and time again. The die is just icing on the cake. Oh my, Nichole, your projects are gorgeous! Especially the page layout. I love the matching die! What a fabulous idea. I think what I really tend to love about your stamp sets is how versatile they all are. So many uses makes for such a great value, that is why I love PTI!! I like the addition of more distressed type images but I still like that the images are crisp and easy to see…I don’t know if that makes sense…but anyways I like it very much and the dies are becoming my most used tools. I love the scrapbook page. The pattern is elegant and fabulous. Having dies that coordinate is icing on the cake! What a great set. 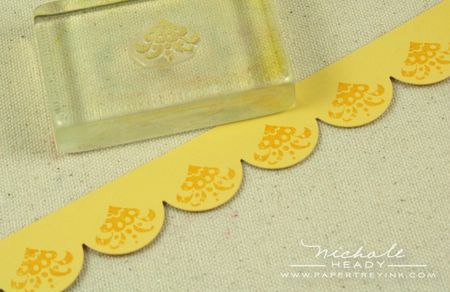 I need a set of flourish stamps. Oh yes the die too!!! Papertrey has outdone themselves once again! Each month I think, “How could it get any better than this!” Then you go and get better each month! I love how more of your stamps are crossing to the “SCRAPBOOK” side. I do both and like to use my stamps as much as I can. This set is definately in my shopping cart. I justy love flourishes and this set is no exception! This set is so versatil. Another great stamp set! What a beautiful set. I just love your scrapbook layout! I really like that matching die. And since I have no flourishes sets yet, this might be the perfect one to get! Love the look of the new flourish set. It is only a click away from my PTI shopping cart! I do love flourishes! I’ve never bothered to cut them out because frankly…it’s too much work! These dies are GENIUS! Every sample is absolutely stunning! You never disappoint! What an amazing set! I can’t wait to get this set and matching die! These are simply beautiful! I really like the background papers on the first card and the overall look of the ‘masculine’ card. This set is so fresh, yet timeless in it’s styling! I said on – it has a great patina! Your samples are wonderful as always. It is so nice to see the set in action in other color combinations. This is the must have Papertrey set! I have seen every release,and purchased lots of goodies, but this set has the vintage styling I adore, and the flexibility we all love about PTI.! With the dies to match, this is an all time fave already! What beautiful examples to show this fabulous set! This can compliment anything & what an elegant touch. Love the matching die & I can already tell the sentiments are right on! The set is fabulous and I can’t wait to use it on cards and layouts! Love the star card. Looks like such a fantastic set. I love the versatility! Fantastic scrapbook page! I also like the Thank You card for its clean & simple style. Wonderful sentiments to this new set too. Wow! I can’t believe how many different projects you made with a single stamp set! I love especially the scrapbook layout, couldn’t believe that it was all stamping! No patterned paper, stickers, nothing! Loved it! This set is definitely versatile and on my wish list!! Such a great versatile set! Beautiful samples! This is definitely on my must have list, however, I think I’ll let everyone else pick it up first. I still haven’t picked up the other flourish set yet. Such a pretty set! And I love the coordinating dies. Excellent!!! WOW! What a creative set! I love all of your cards you created with it, especially the simple Thank You one. Fancy Flourishes alone is very elegant but now teamed with Embellishments stamp set and matching die, it is extraordinarily elegant!!! I love all the samples but I think what I would most likely incorporate in my projects is the 3-D embellishments with the die as in the first scrapbook layout. Love how it enhances the page beautifully and gives it that special touch as it frames the picture. I soooooo love how Papertrey Ink has new dies to coordinate with some of the stamps. These are great. I can’t wait to see the rest of the sneak peaks. Cool set. Thanks for the chance to win it. Love the scrapbook page of your daughter! Wow! What a gorgeous stamp set! I love the idea of using it to create your own background papers!!! Pretty…..but I have never been comfortable with this type of set. Fancy Flourishes is one of my most used sets, so I am sure this flourish set will be a favorite too! Everything about it looks gorgeous! LOVE THIS! I think this will add a really great touch to scrap book pages, and I’d like try to diecut heavier materials like chipboard and then emboss to get even more texture. This set is both classy and elegant. I’m also excited about the new mat stack die. I’m in love with those! Still waiting for a set to come out to go with those:) Can’t wait til the 15th, my fingers will be ready to click “add to cart”……lol. wow! this set looks like it is going to be a lot of fun, and yet so elegant. Very cool! These flourishes are beautiful! Love how they work for lots of different styles…and the dies, wow! Your ballet page is so sweet! So happy to see you combine stamps and dies. Love the swirls in the set. Also love the new mat stack die. This set looks like a great set for backgrounds, making your own designer paper, etc. I can see this set making beautiful wedding or shower invitations. What a beautiful set. Can’t wait to get this. There are endless possibilities, birthdays and holidays. Your cards and scrapbook page are stunning. Wonderful set and marvelous die. A great prize package that I would certainly love to win. I can’t tell you how excited I am about your dies. This on with the flourishes – truly amazing. You’re so creative! I wouldn’t have thought to use the embellishment stamps on a scrapbook layout to create such pretty patterned paper. What a great set! I could see using this by itself or to accent other stamp sets. I can’t wait to get this set! Love, love, love it! Love how the set coordinates with so many others. oh, I love the new dies…keep ’em coming!!! Those swirls are just fabulous!! And matching dies? Talk about genius! I love that they are so versatile. Can’t wait to get my hands on these!!! Love the large flourishes….and dies to match….wow! One can never have too many flourishes!! I love the new distressed flourishes and am even more excited that they can be die cute. I absolutely loved the scrapbook paper you made….it was so soft and girly. As usual, you’ve created another stamp set that I must have. The flourish images are gorgeous, and the flowers made with the set are so different and fun. Can’t wait to play with these! Such a classy presentation. The scrapbook page is just perfect in everyway–but then you surprised me withso many other ways to show its versatility. Definitely my favorite week of the month on blogland. All beautiful projects today! Love the versatility from one set! Thank you for the inspiration. The flourishes are beautiful on their own. But add the new dies to the mix and their flexibility skyrockets! Since I’m scissor challenged, the dies will be a must purchase. Your projects are so lovely and versatile! I don’t think I “need” anything, but after I see what you create, there is a need!